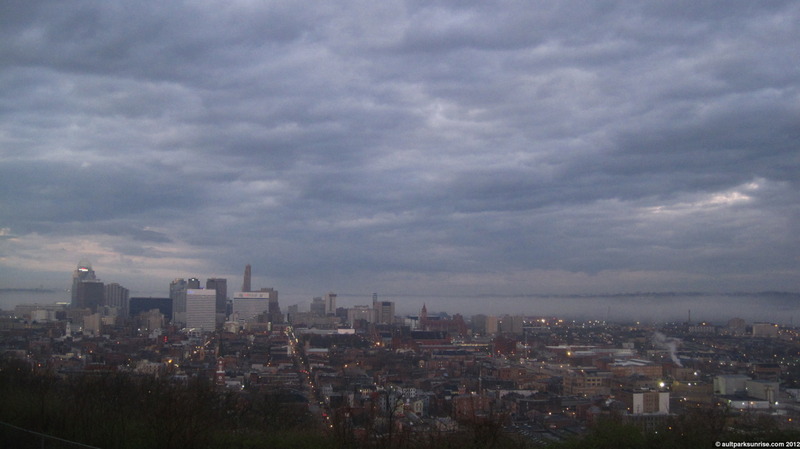 Over-The-Rhine & Downtown Cincinnati against a massive fog bank over the Ohio River. As seen on the morning of St. Patty’s day from Bellevue Hill Park in Clifton. We stopped by Mt. Adams for a beer & a Rugby game (oh, and another free breakfast!) at Tap & Go. Here we look out over the Ohio River from Mt. Adams. This year the wife and I decided to celebrate St. Patrick’s day by getting up super early and heading to Clifton for a free hot breakfast @ Murphy’s Pub. I realized right away that this would put me within walking distance of Bellevue Hill Park, one of my favorites in the city for its historic location, so I made sure to grab my camera and bring it along with me for the ride. We ended up spending the early morning in Clifton, the mid morning in Mt. 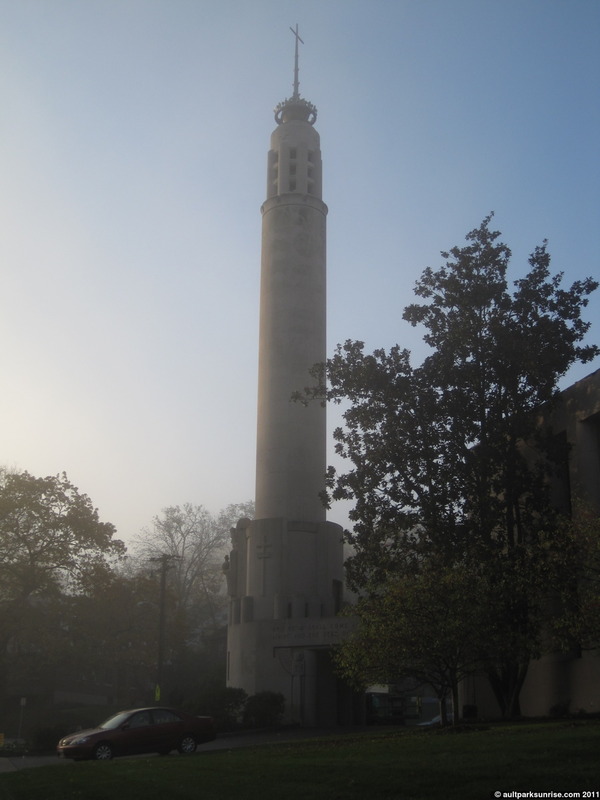 Adams, and the late morning in Newport, Kentucky. As we traveled around the rim of the valley (and finally down by the river), I kept track of the thick fog that sat along the Ohio River. By the end of the morning the sky had cleared up and I found myself gazing at the Cincinnati Skyline under a summer-esque blue sky with rolling clouds. We started off our morning at Murphy’s Pub in Clifton. Murphy’s Pub is a Clifton classic and they sure know how to host a party. Their breakfast (and green eggs) were superb and the crowd was a nice mix of students and locals. 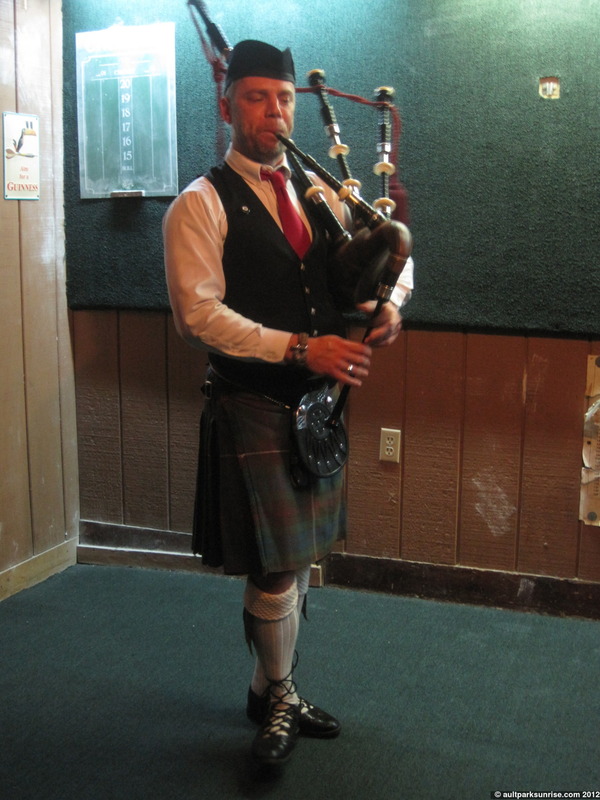 This bagpiper scared the pants off of us as he started his morning serenade at 6:30am. 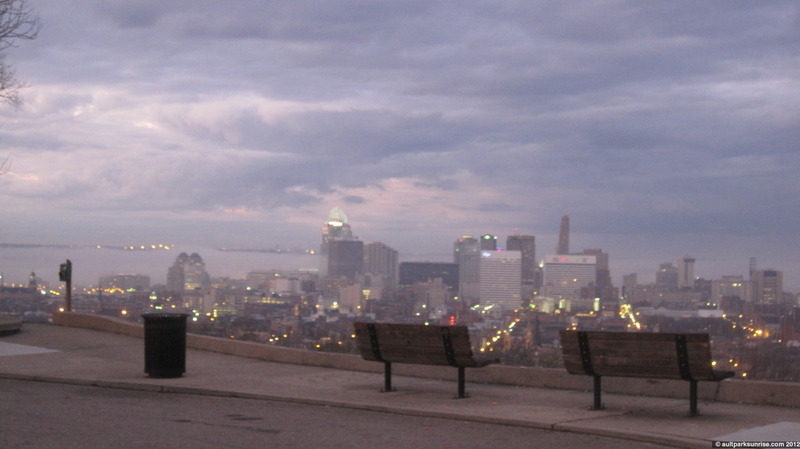 When I first arrived in Clifton I made the immediate realization that I was only two blocks from Bellevue Hill Park, my favorite park in the Clifton area due to it’s history and breathtaking view of Downtown Cincinnati across Over-The-Rhine. I jokingly offered the other members of our party a chance to join me in a jog to the park, but none of them cared to take me up. I ran into a friend from school, Duffee (who is actually my “little brother” from our days in the fraternity), who is always up for an adventure. He joined me as we high tailed it up to the park at day break. 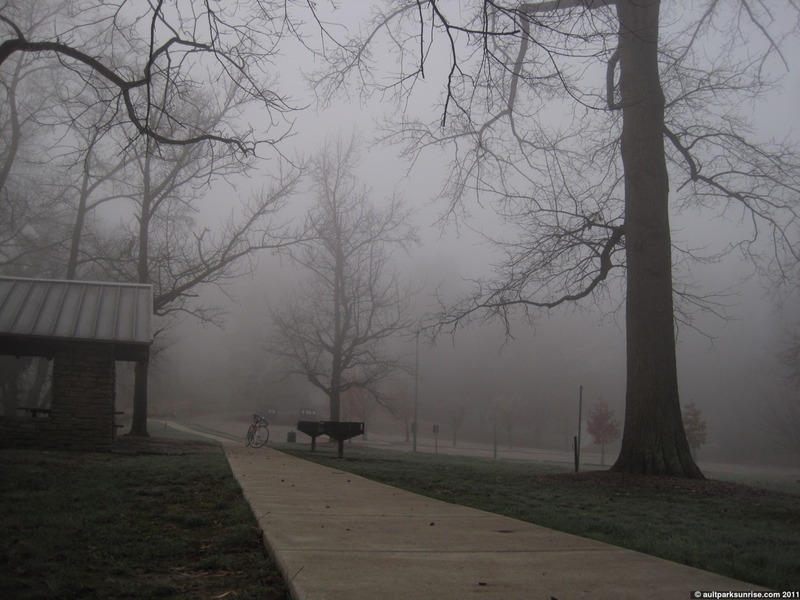 We arrived in the park to a handsome view of a tall & fluffy pile of fog hanging over the Ohio River. 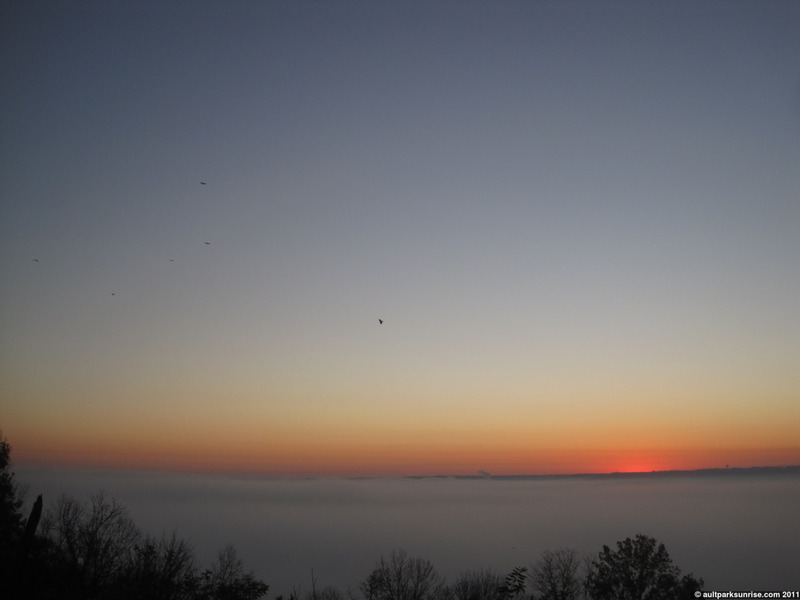 At first I was disappointed that we weren’t going to get a colorful sunrise sky, but that disappointment was replaced with joy when we saw the wall of fog that provided a beautiful backdrop to the Cincinnati Skyline. 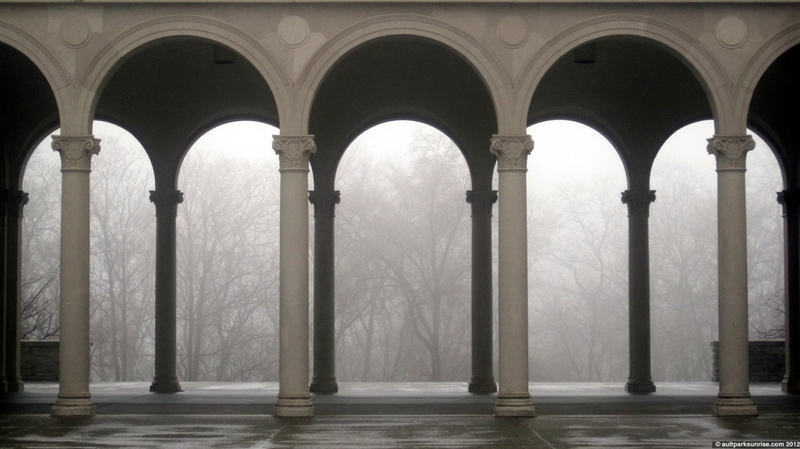 A misty view of Ault Park Pavilion. 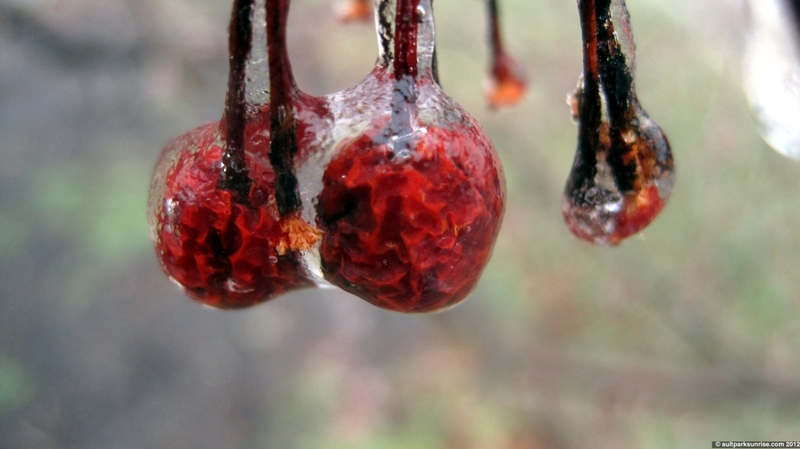 Did you know that cherries shrivel up like a rose when they’re engulfed in a globe of ice? Me neither. 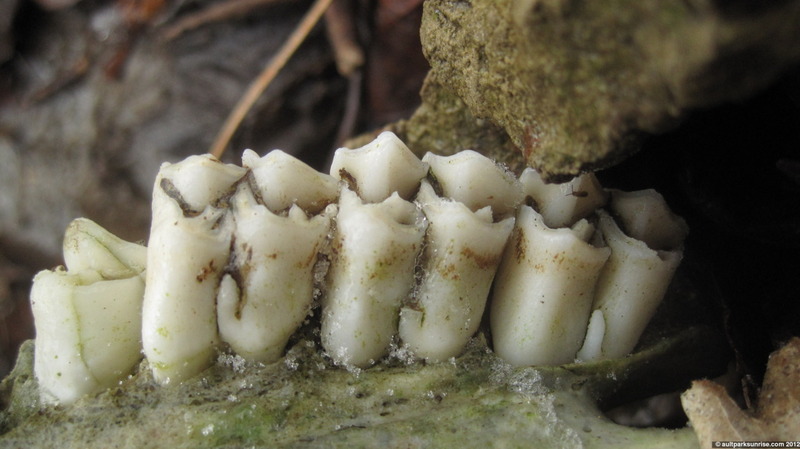 Or perhaps they were already shriveled before being frozen. Either way, it adds a bit of color to this otherwise grey-scale set. This post is coming a day late! The weather has been downright crazy in the past few days and so it’s funny to see that by the time this is posted, all the ice is gone and it almost feels like t-shirt weather! Late Friday night an ice storm rolled into the tri-state. Saturday was marked with careful maneuvering over exposed sidewalks. 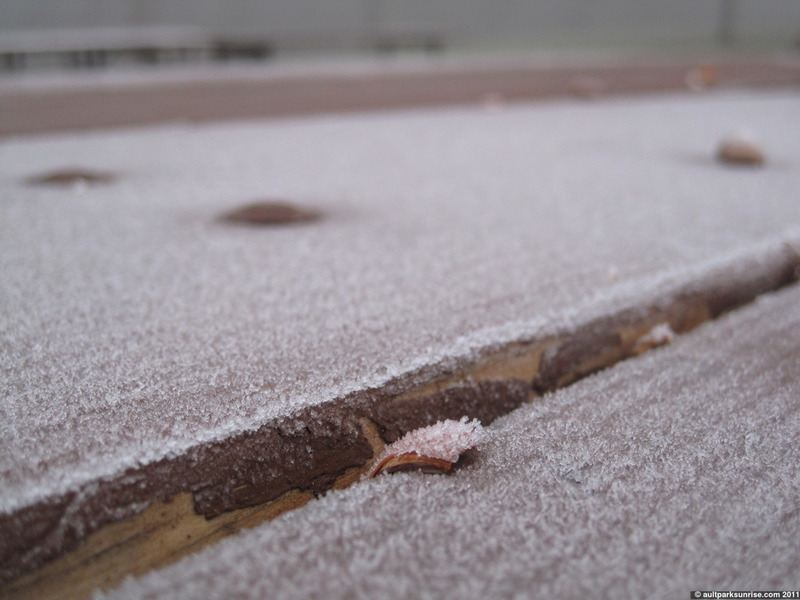 It rained heavily in the early morning, and then the temperature dropped out and froze everything. 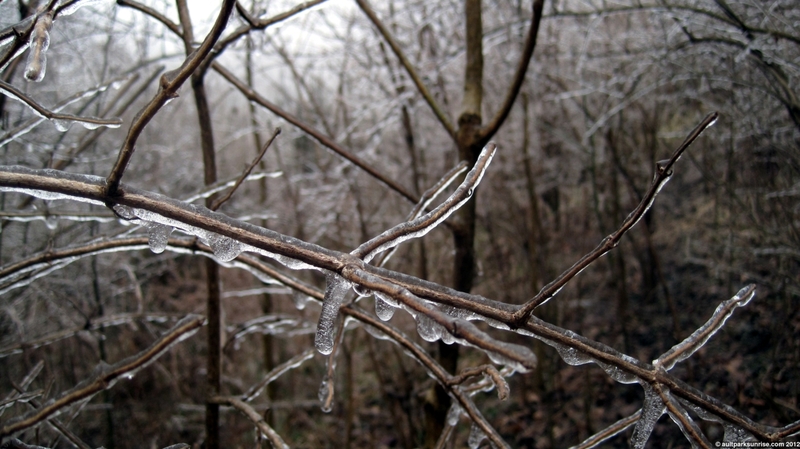 The trees glistened all around, covered in a half inch of clear ice. Sometime late Saturday afternoon I realized that I really wanted to get a picture of my “Tree of Heaven” silhouette while it was still covered with ice. I headed up to the park early Sunday morning for “sunrise” and found that the park was an icy wonderland. This is particularly interesting because all the ice was melted away by Sunday afternoon and today’s high was 63F. 63F! In January! 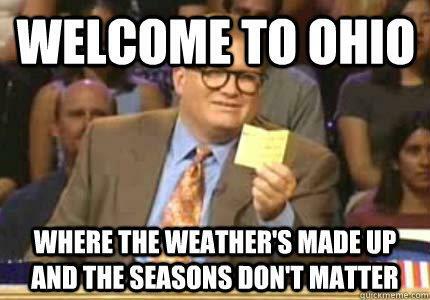 We had an ice storm followed by t-shirt weather within 36 hours. Insanity! I saw this on /r/columbus today and thought it was appropriate. A hat tip to the show Whose Line Is It Anyway? 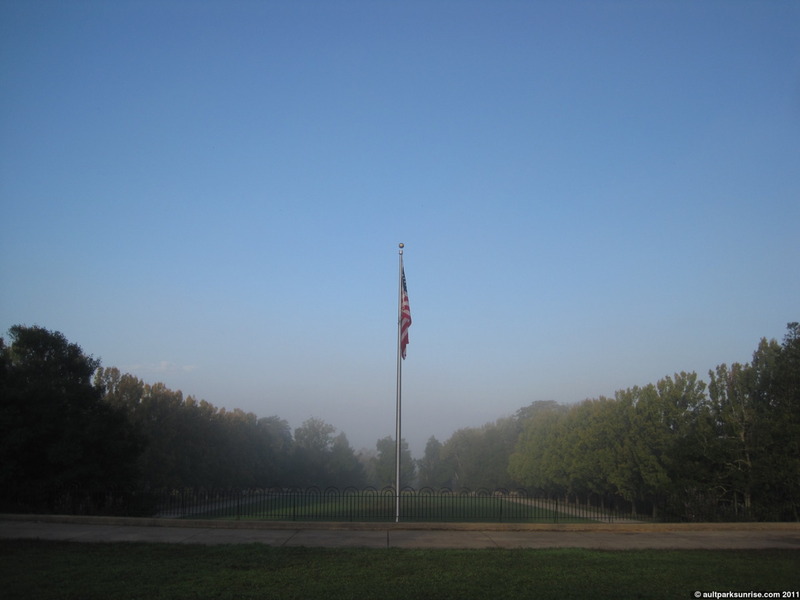 The park this morning was particularly solemn. On one hand, it was a Sunday. This meant that the commute up to the park was quiet with little car traffic. However, normally a Sunday means that there is more people in the park on their day off. This morning, while there were certainly some dog walkers hanging by the sidewalks, I found no patrons who ventured much beyond the ice-covered streets. 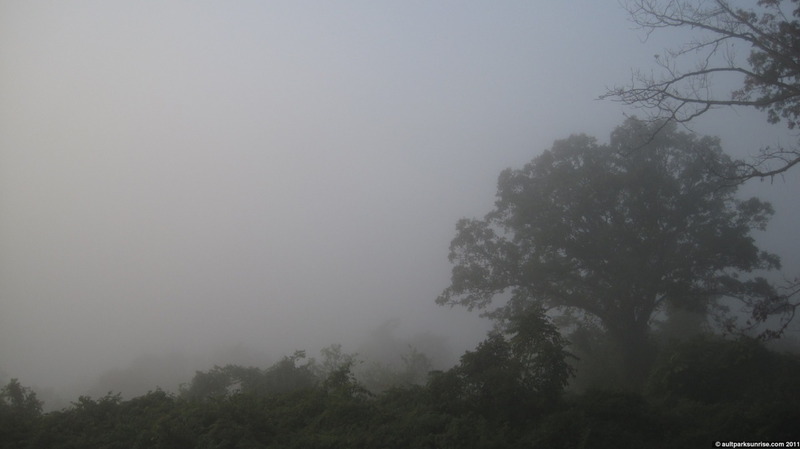 There was a lot of moisture in the air which made a light layer of fog that hung in the backdrop, blocking the view of the valley through the forest. 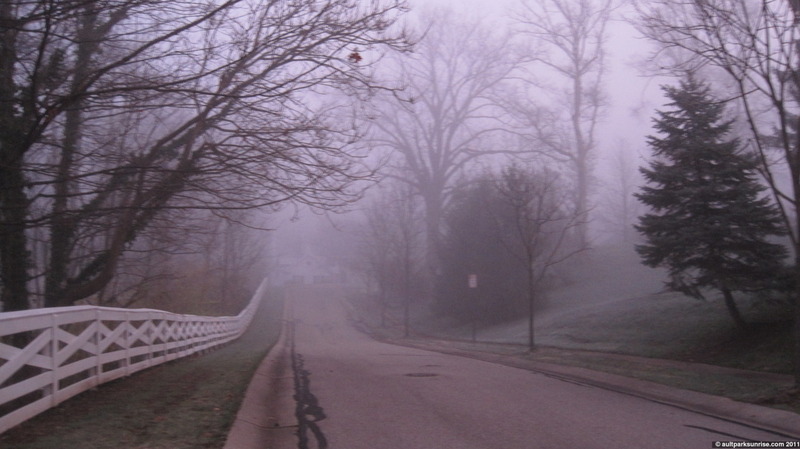 It also had that quality that I love about fog – the muffled air effect. Far off sounds, like an airplane landing at Lunken Airfield, become drowned out as the fidelity is lost. 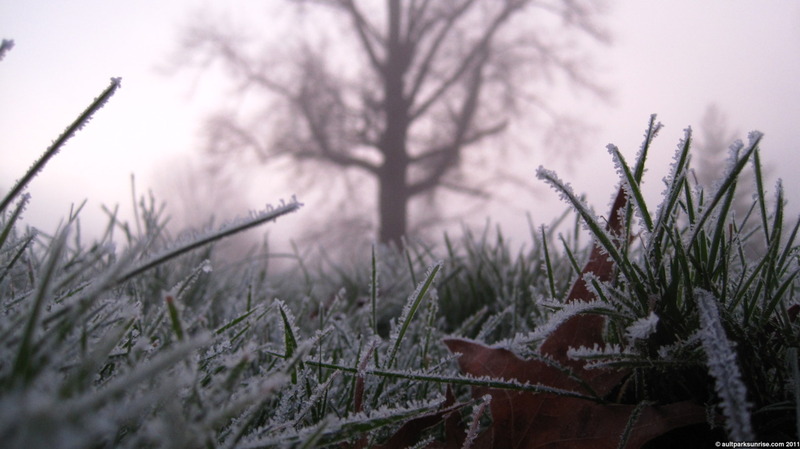 Other sounds in the foreground, such as bird calls and branches straining under the cold, bring themselves more to the front of attention. I found that the streets were mostly clear of ice, so I had no problem climbing the hill to the park. Upon entering the park, however, I was greeted with a Road Closed sign. Having wiped out several times over the past year on my bike, but curiously enough none in the past 10 months (I am a slow learner, but when I finally learn I’m not quick to forget! ), becoming intimate with the asphalt was not something I was hoping to accomplish this morning. Apparently the city trucks do not service the roads through Ault Park (or at least not as a high priority) because beyond the park entrance the road was covered with a thick layer of ice. 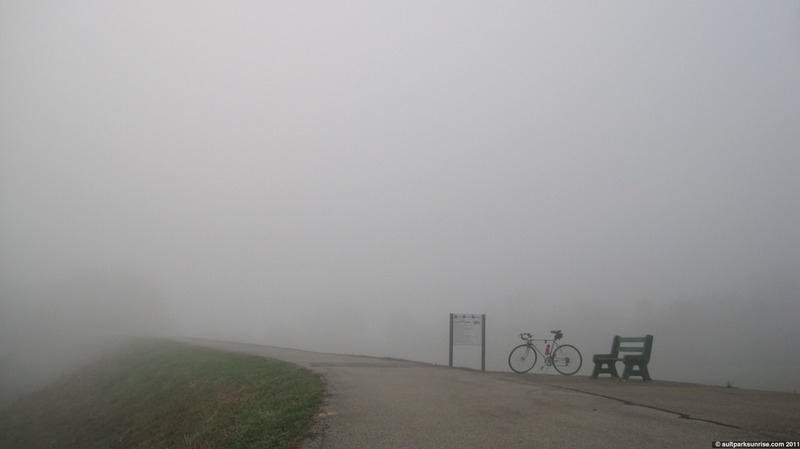 I had to walk my bike to the overlook, a task which made me appreciate the mobility that a bike offers oneself. 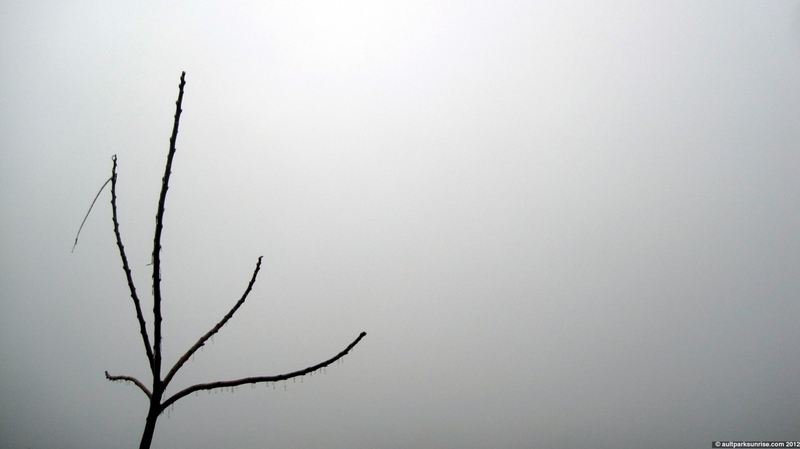 There was no sunrise this morning due to the valley fog. 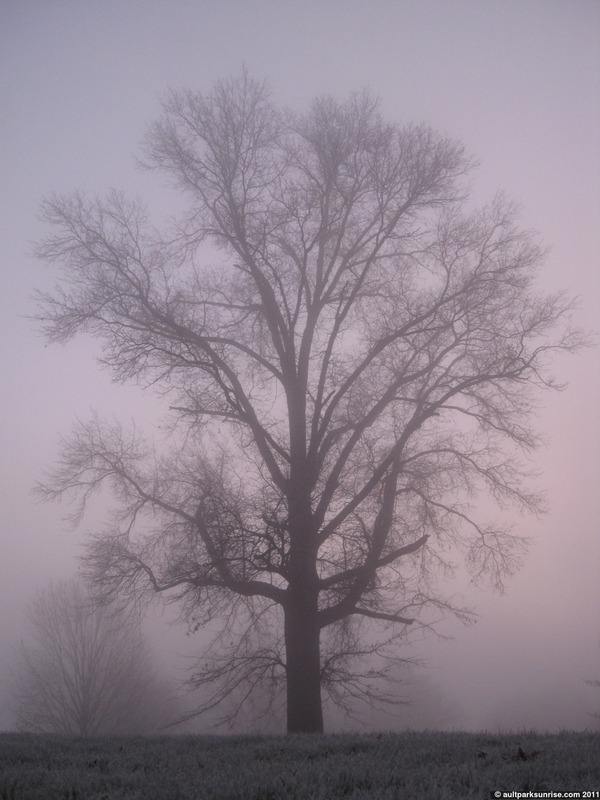 My little “Tree of Heaven” silhouette worked out nicely against the gray backdrop. 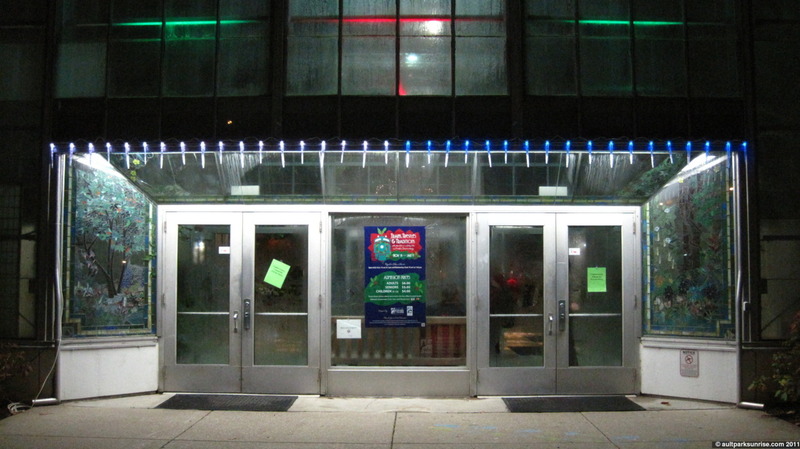 The entrance to the Art Deco Krohn Conservatory at the end of the Holiday Tree Lighting party. Check out the parallel lines, a signature of the style. Also note the humidity dripping from the glass panels. 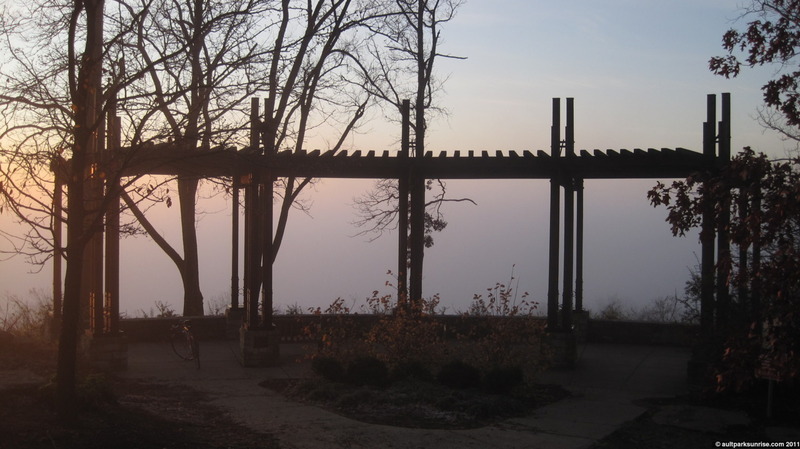 As I climbed up to the top of the pavilion, I realized that I could see the fog layer out across the western sky. 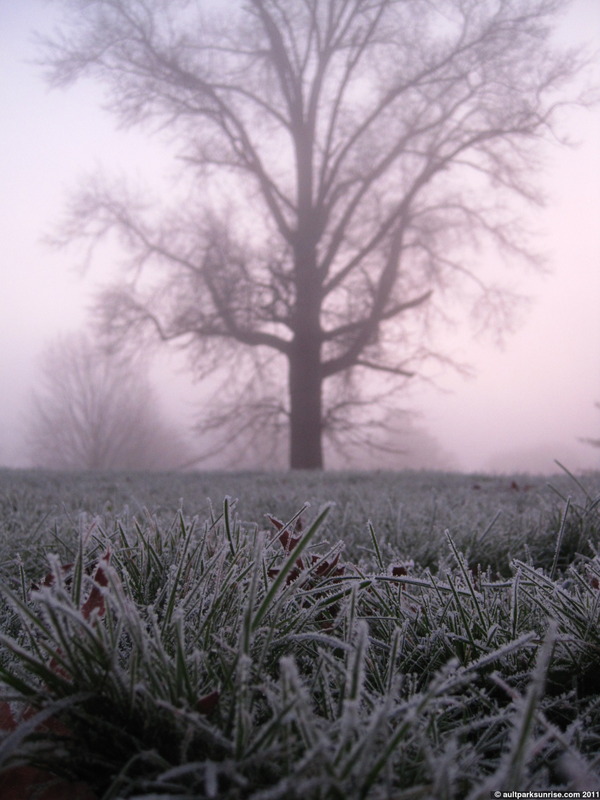 This is a new look for the park – fog and ice! 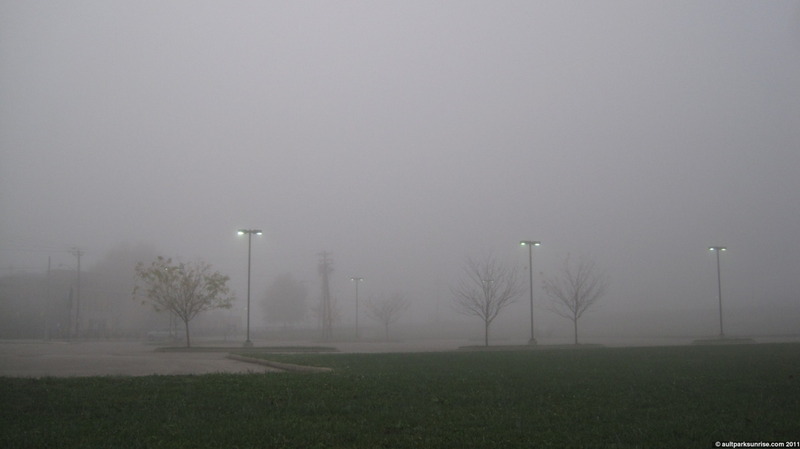 The atmosphere this morning was foggy for the second day in a row. I’m beginning to wonder if we’re close to setting the record if such a thing ever existed. 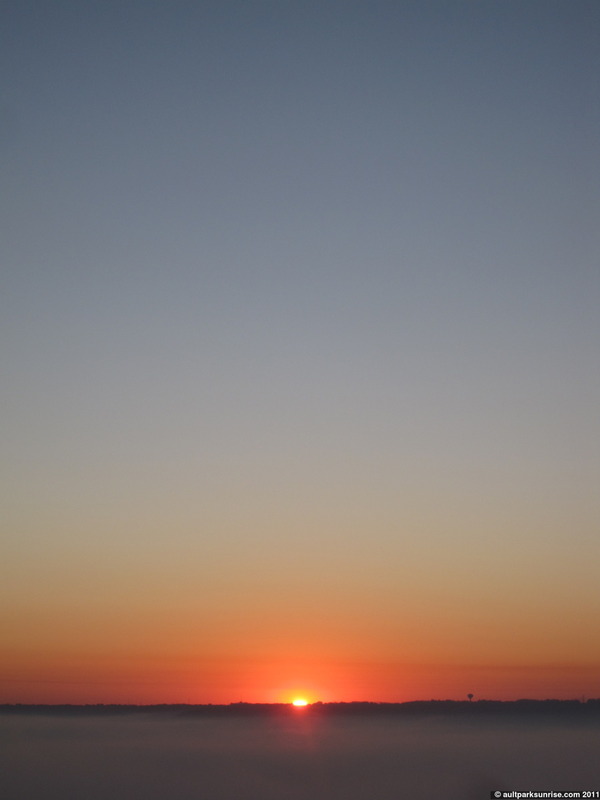 I could see the sunrise’s deep red glow from Mt. Lookout Square, where I stopped by UDF to get a coffee refill, but by the time I climbed up to the park the fog had blown in from from the valley. 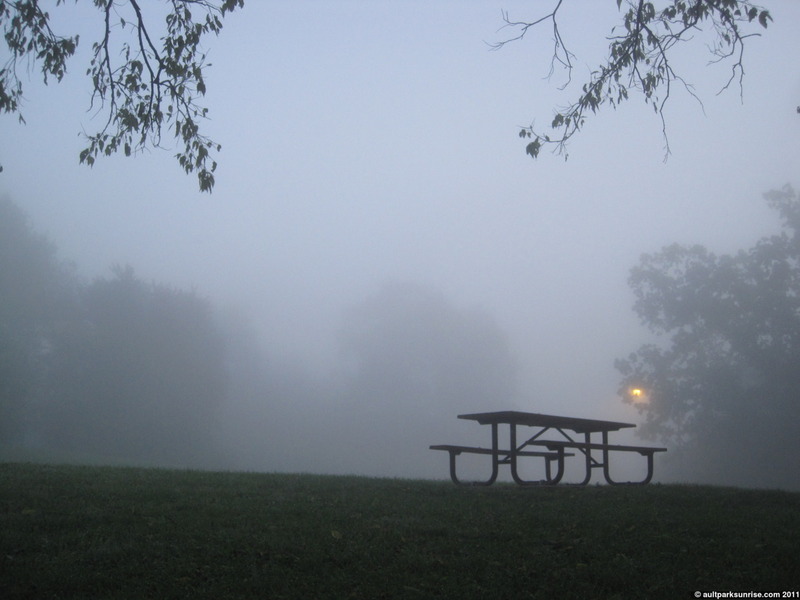 The fog started to get thick as soon as I entered the park. The strange thing that really stuck out to me this morning was the bird activity in the park. It was almost as if today was the day that the swarms of birds chose to gather in Ault Park before heading south for the winter. I have no idea of sparrows or crows migrate, but both birds were present in outstanding numbers this morning, filling up the sky and making a whole ruckus of noise! I even have a video of the “Murder of Crows”. There were at least 100 (I took a video) crows high in the trees this morning and their silhouettes were easy to find against the bright white background and naked branches. I’ve seen a handful at a time of these giant birds at the forest’s edge looking out over the valley, but this morning the murder moved together in a loud, squaking, organized group. 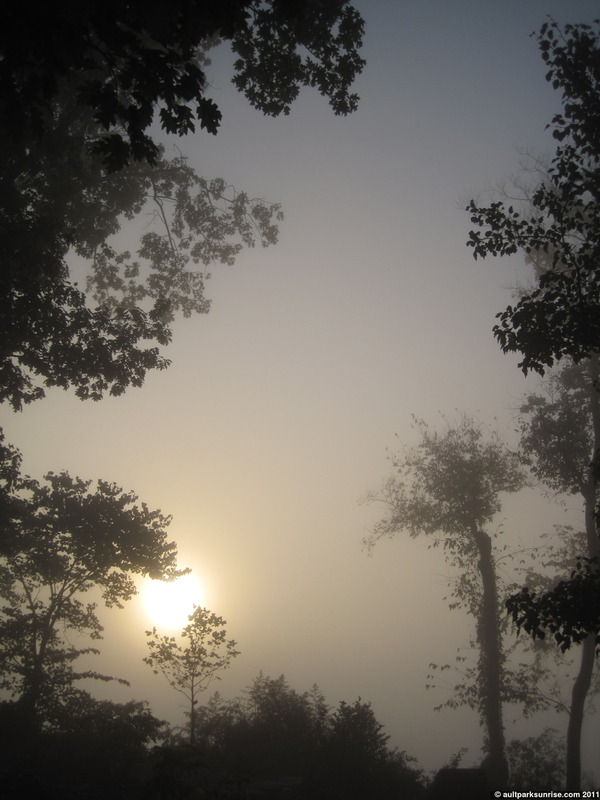 I could hear them even as they moved deep into the forest even though they were hidden by the fog. Last night the wife and I visited Krohn Conservatory in Mt. Adam’s Eden Park for their annual tree lighting ceremony. It was a really great time and there was excellent food and drinks. If you’re local to Cincinnati I highly recommend joining the Cincinnati Parks volunteer program because you get to hang out with some neat people and get invited to events like this at the Krohn :). The Krohn has a neat holiday display this year. A group came in and created a miniature train display that highlights several local Cincinnati landmarks as well as a few international ones. The trains glide around the fantasy landscape that is filled with the temporary holiday flowers and plants as well as the permanent citrus trees. The Krohn Conservatory is such a great building and we’re lucky to have it! I was happy to see the Mt. 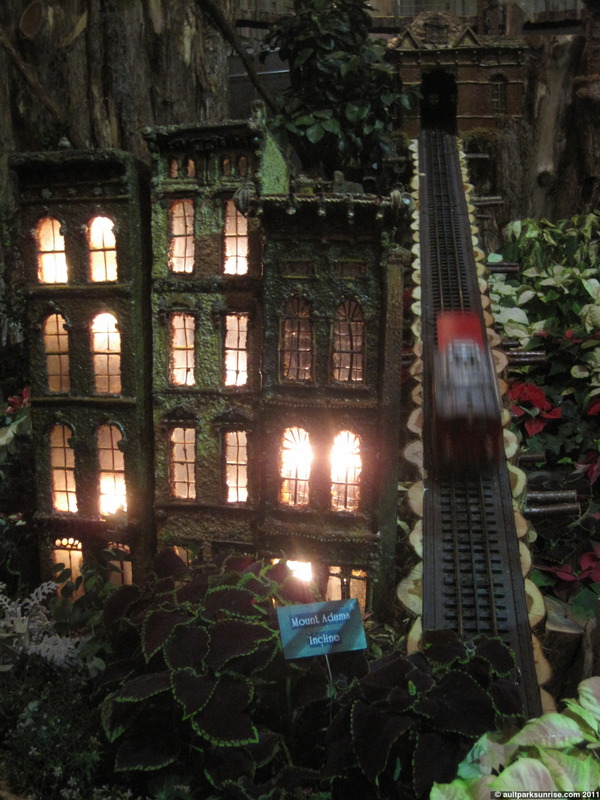 Adams Incline represented in the train display @ Krohn Conservatory! 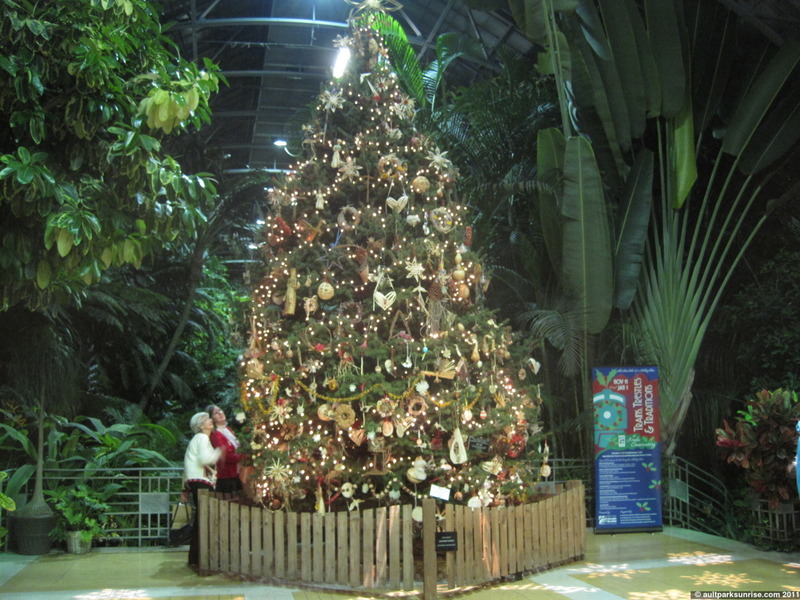 The giant pine lit @ Krohn. If you love plants like I do, be sure to pay the Krohn as many visits as you can! Especially at NIGHT during the winter. When you walk into the dark humid tropic room as ice crystals form on the green house panels, you feel like you’ve entered another world. The entrance to the Art Deco Krohn Conservatory. Check out the parallel lines, a signature of the style. 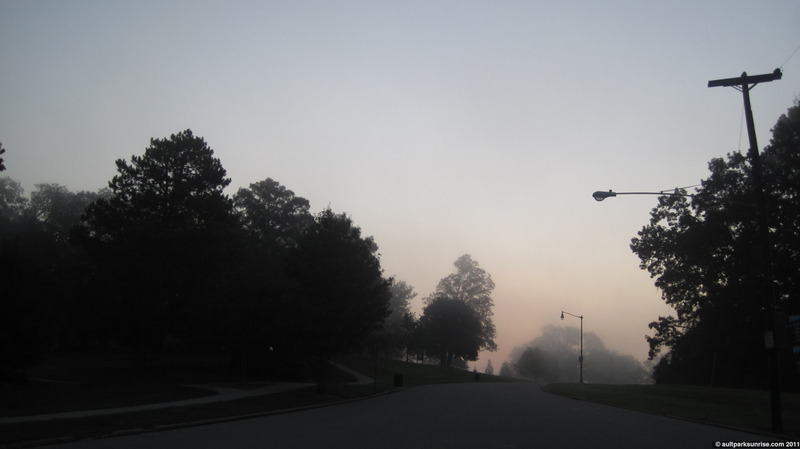 As I entered the park, it was obvious that the sunrise was going to be a foggy one. My morning coffee spot @ the “auxiliary” area in Alms Park. I didn’t make it all the way up to the top of the hill. It is so quiet here. The perfect spot to study or swing while listening to the planes come in. This morning was one of those rare days when both the weather and my mood for exploration aligned perfectly. I was anticipating getting up early today all week after watching the forecast closely to see when the weather was expected to break. We’ve had two solid weeks of rainy overcast mornings with only one exception, which was last friday (after Thanksgiving). I was travling to visit family so I wasn’t able to see it! 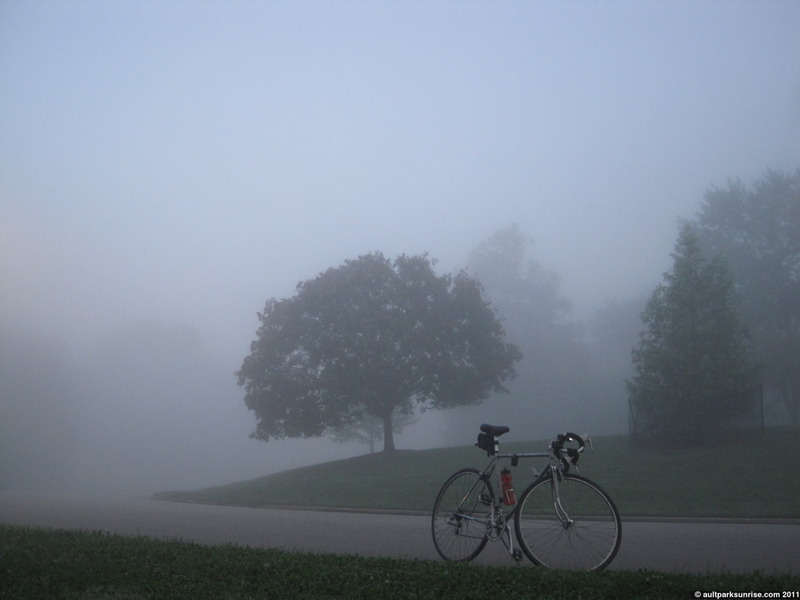 I was so excited for this morning that I woke up a half hour early and started off on the bike while it was still dark and foggy. I’m hoping tomorrow’s sunrise has some surprises for me because the sunset today was truly fantastic – deep blue and teal with purple clouds and orange highlights. We’ll see! 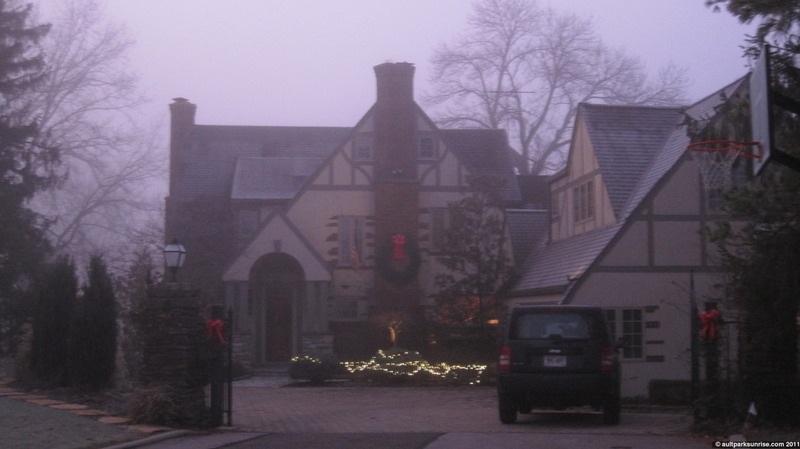 I’m also looking forward to doing “find the Christmas Lights” in the fog, but this morning was too early in the month and only a handful of homes had their lights on at 7:15am. 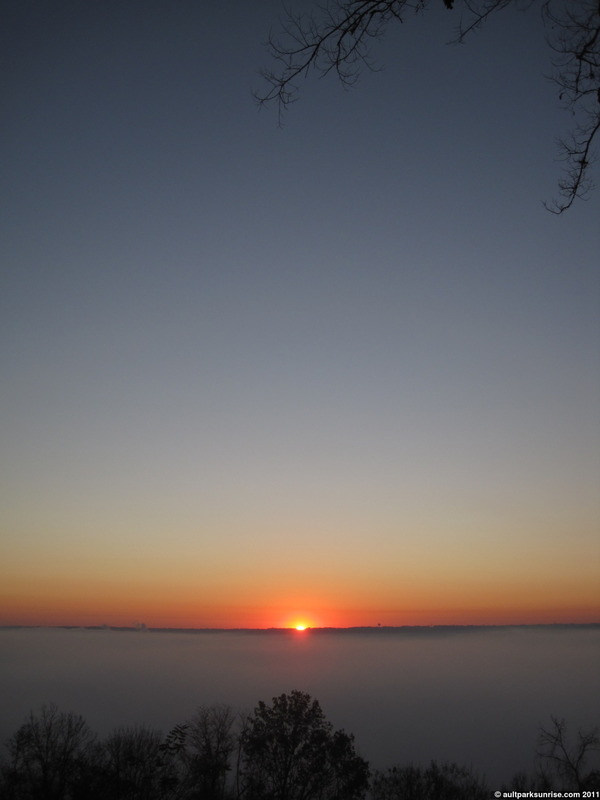 The weather helped support my naive theory that states “overcast and rain followed by clear sky sunrise = fog in mt. lookout”. This morning was no exception! Although I can say that I was a bit disappointed that there was no clear sunrise, I can’t pass up an opportunity to explore in the fog. 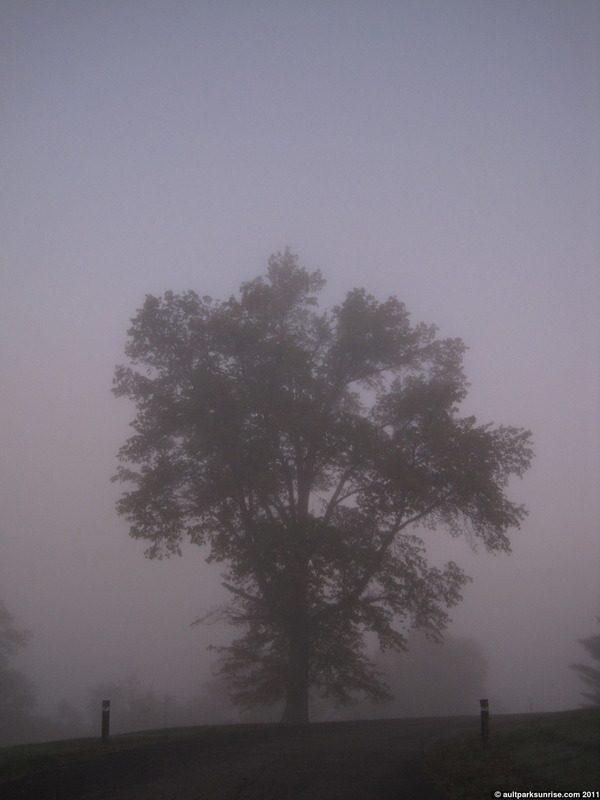 This morning’s fog was thick, too, one of the thickest so far. I’m getting spoiled with these foggy days! I only had a couple in the spring, almost none in the summer, and now this is like the fifth or sixth one this fall! 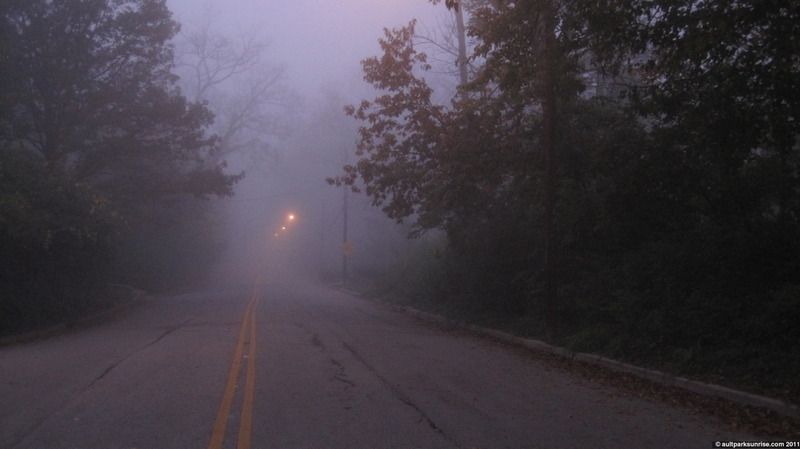 (you can usually check out the “fog” tag or “foggy” for more foggy posts). 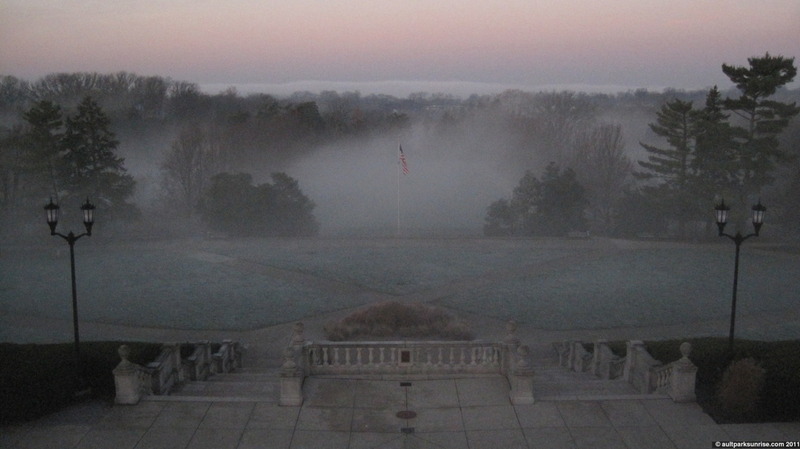 So far I’ve spent foggy sunrises at Alms Park (one of my favorite posts this fall), Lunken Airfield, and Ault Park. This morning when I set out for my twilight ride, I decided that I wanted to go back to my roots and explore some residential pockets that I haven’t visited for awhile. 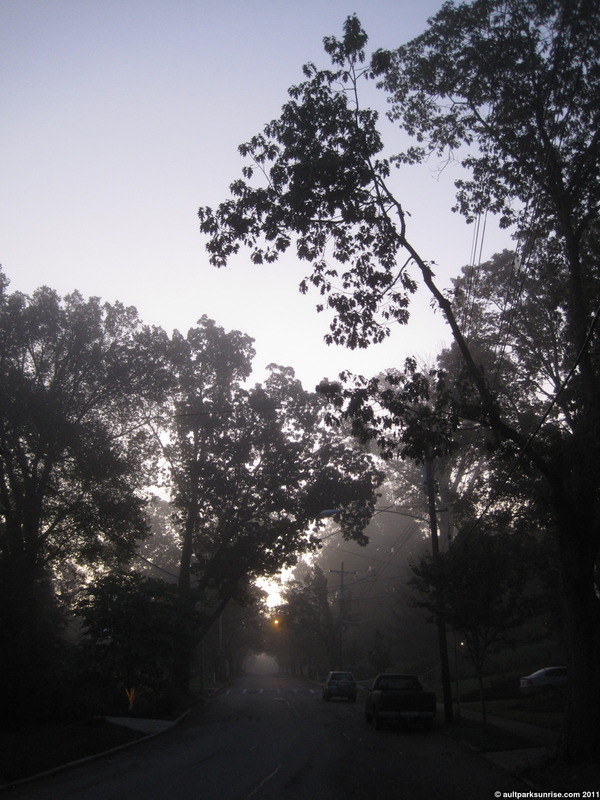 You see, last autumn before Ault Park Sunrise was even an idea, I started my exploration of my local neighborhoods, hills, and parks on my bike. At the time of course I didn’t know I was actually training for Ault Park Sunrise. 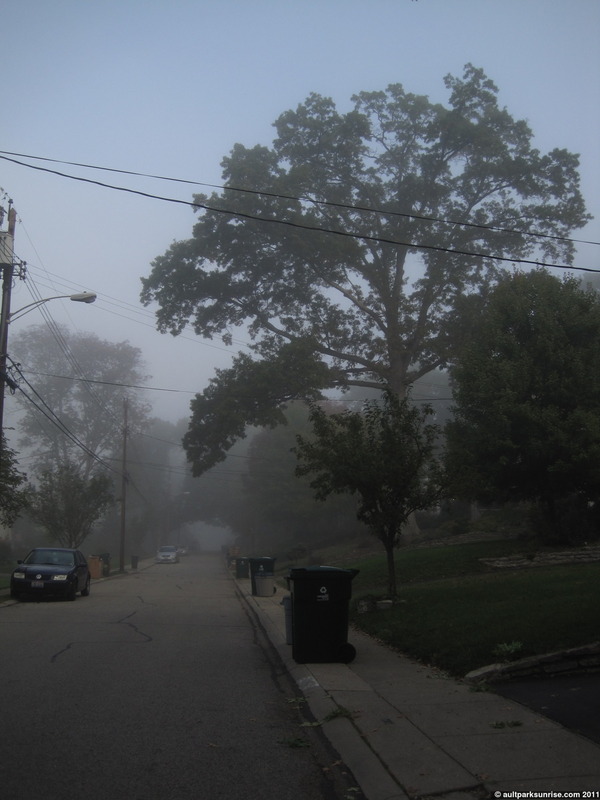 My first fog explorations was when the neighborhoods were new and unexplored and so I would creep along the No Outlets and see the beautiful homes and landscapes that Cincinnati’s old residential neighborhoods are known (because the homes and plots of land fit snugly into the hillsides so there are lots of creative designs). This morning I wanted to revisit some of these No Outlets in the fog and see what else I could come up with. 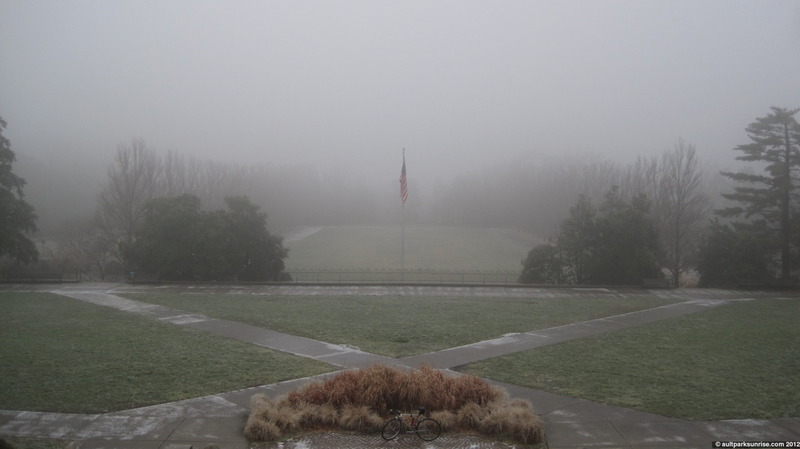 As it turns out, the weather this morning was one-of-a-kind. Normally when the fog comes through, it is in both Mt. Lookout AND down in the river basin. OR it is in the river basin alone and not in Mt. Lookout. This morning, however, there was no fog down in the basin so Mt. 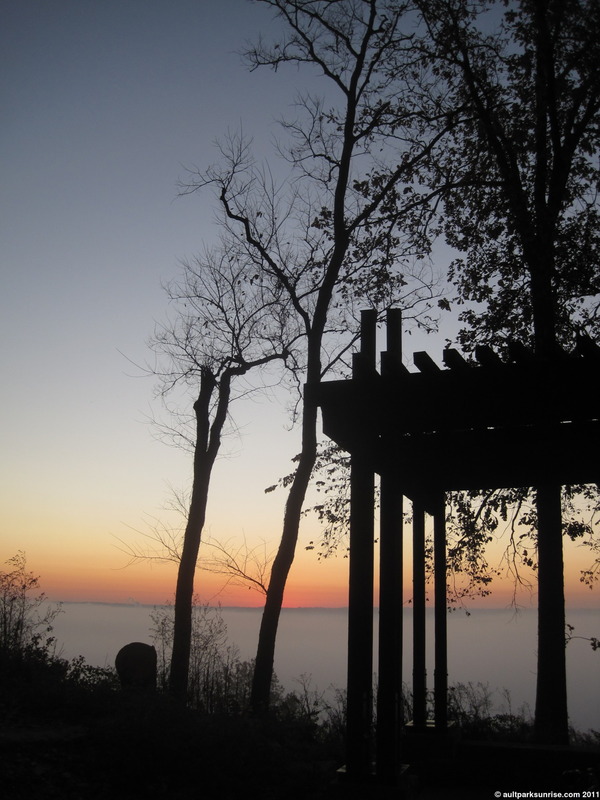 Lookout was covered in a low-laying cloud layer. 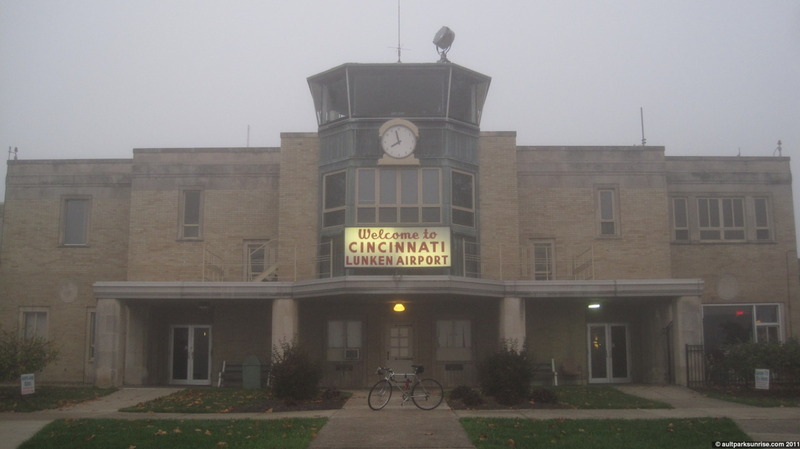 I ended up dropping down into the basin to visit Lunken Airfield after realizing that I could get a much needed workout in. 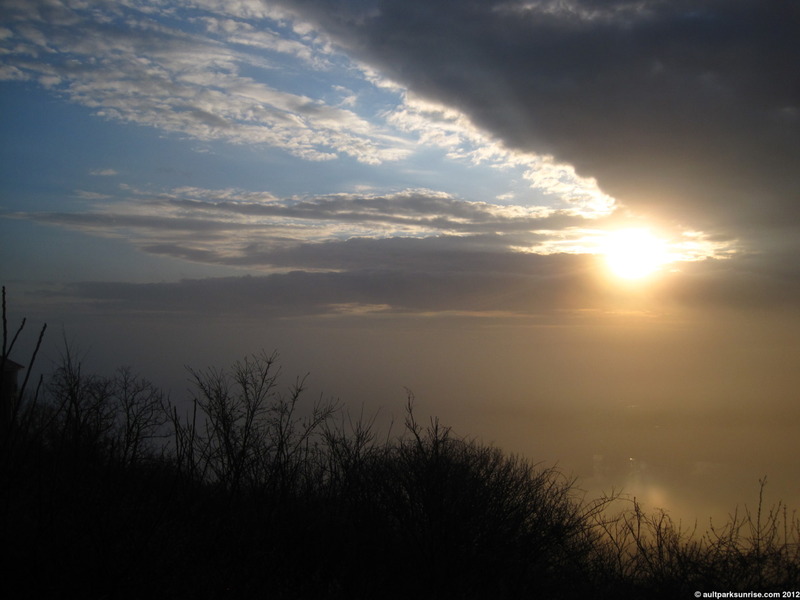 The clouds and fog had just broke and the sun was blazing through across the horizon underneath the cloud banks. It was really pretty and surreal because I could look behind me and see the hillside of Mt. 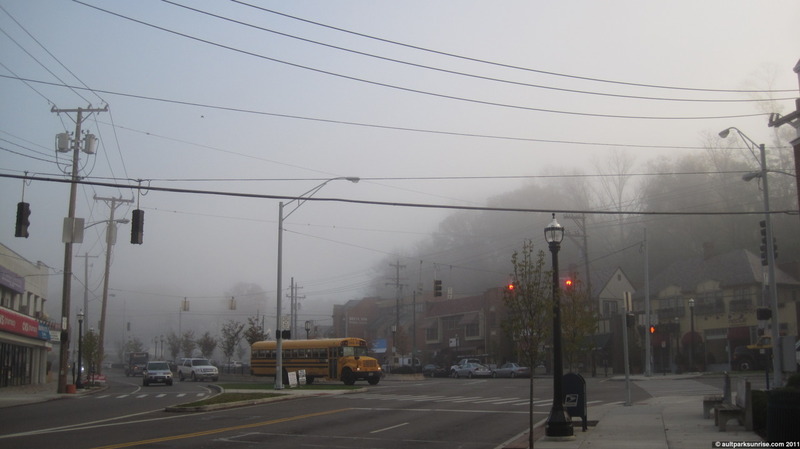 Tusculum rising up from the clear streets of Columbia Tusculum and East End to disappear into the thick fog. My first “No Outlet” of the morning. A bit blurry because of the low light. I love this house and the way the gates open into the cul-de-sac. On the way to Alms Park, I swing down Kroger Ave to check out Kroger Valley. 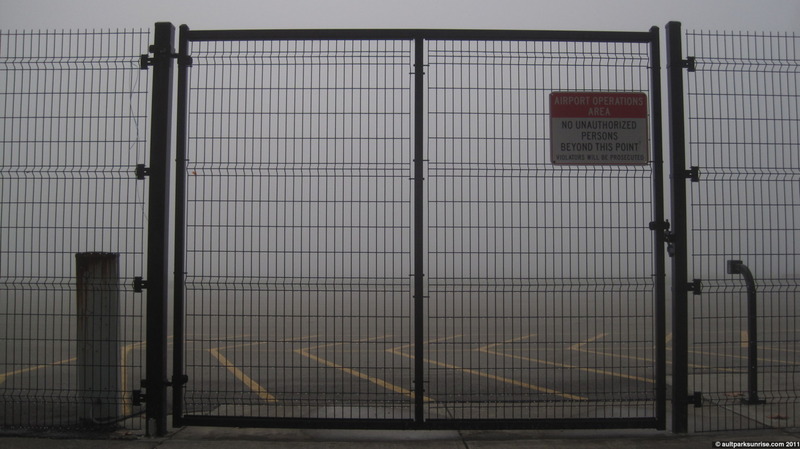 The white fence and street disappear off into the fog. 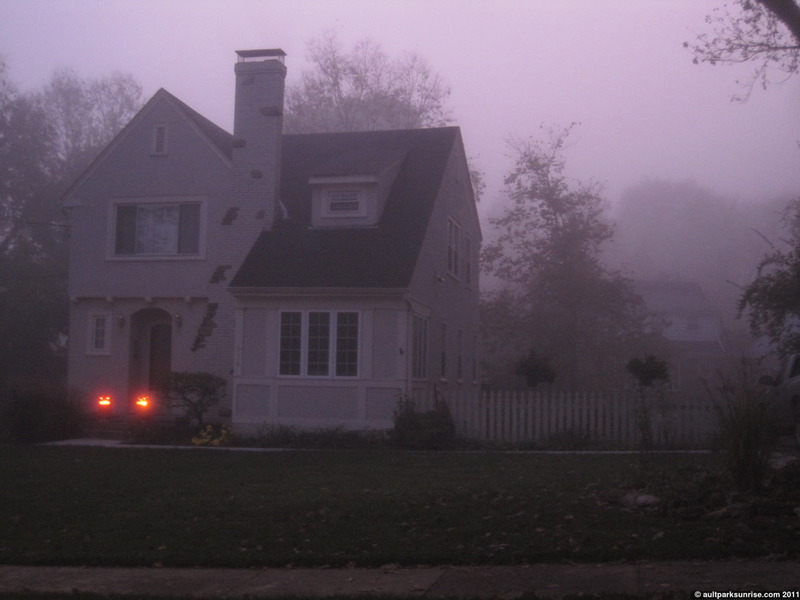 There is a home at the end of this “No Outlet” as well, but we can hardly see it in the fog. 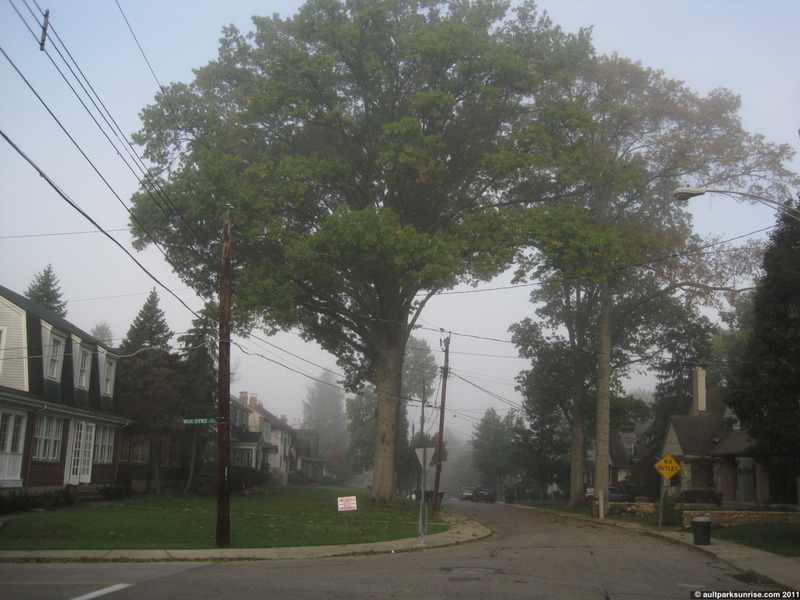 This magnificent Oak first caught my eye in the last Alms Park fog run. That’s the neat thing about fog, it causes different patterns to emerge and make themselves present if you’re paying attention. This oak sits in the lawn of St. Ursula’s Villa. A bit closer up. 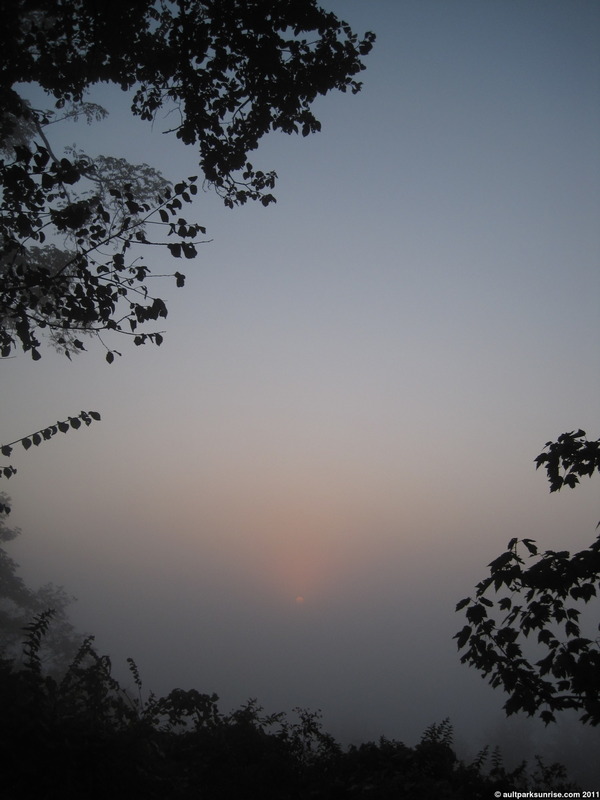 It’s hard to tell from the picture, but there is a light aura in the fog just above the horizon where the sunrise is getting ready to make an appearance. This made a perfect backlight for this oak tree’s silhouette. I love the frozen dew. This morning’s sunrise was pure autumn beauty! 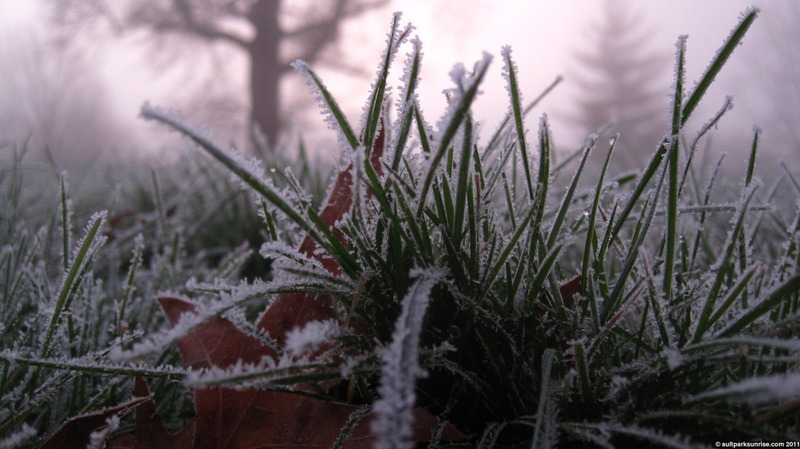 The temperature is holding steady at a cool 32F, 34F after sunrise. The sky was devoid of clouds and the humidity was high. I heard last night on the local weather channel that this morning was going to be “clear and chilly” with humidity of around 77%. After yesterday morning’s dark and gloomy sunrise (which I happily stayed at home in my warm bed for!) 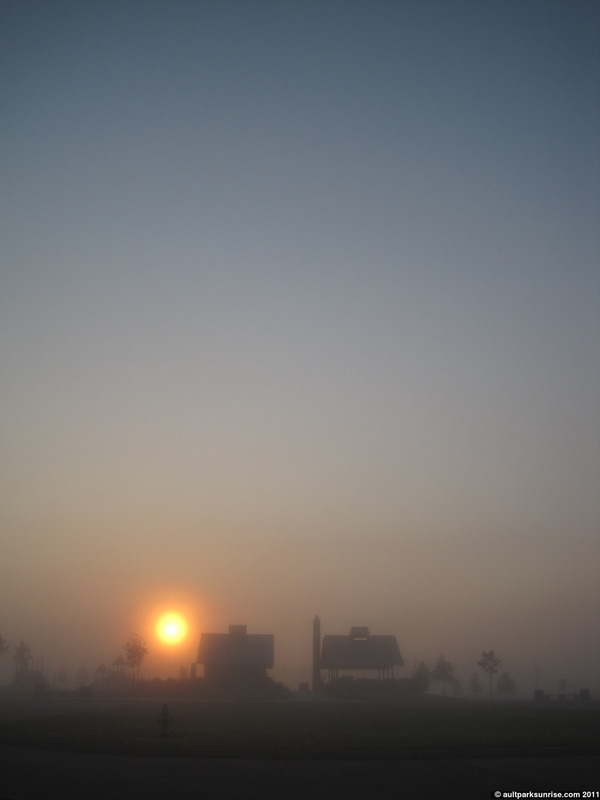 this meant that there was a good chance for some morning fog for Sunrise 112. 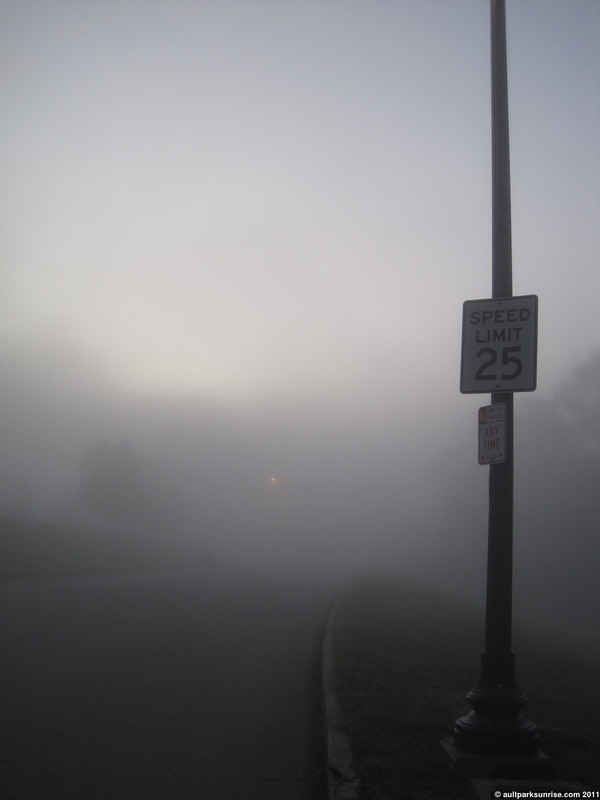 I’m beginning to understand how to predict fog at least to a nominal degree. 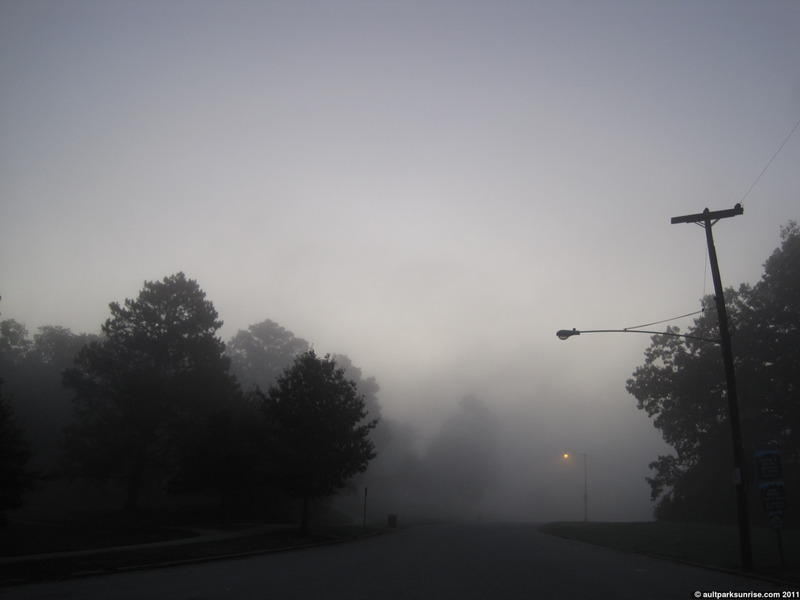 Clear skies after a gloomy day seem to be a good predictor, but it isn’t certain and there are definitely other factors that can create fog as well. There was lots of bird activity this morning and also lots of people activity. Sunrise was at 8:06pm by my clock and with the clear skies the atmosphere was already lighting up in a bright but muted gray color by 7:20am. The high humidity added an interesting twist this morning. 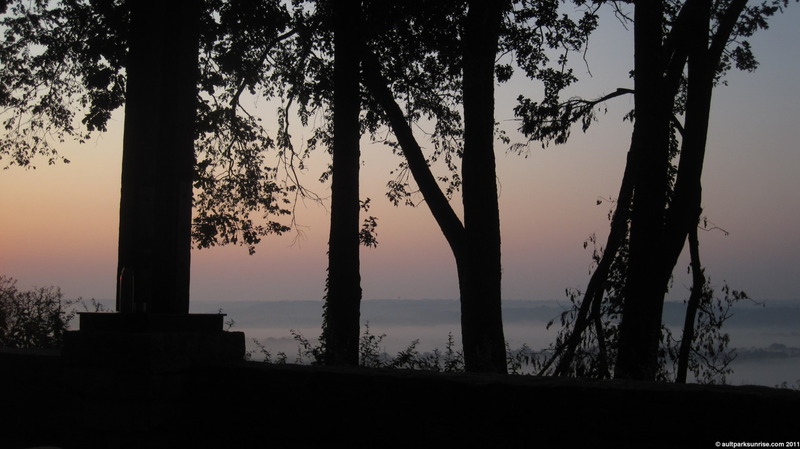 The sunrise was quick like I’ve come to expect with the open atmosphere free of clouds, but with the high humidity and the light mist, the sky did not take on a deep saturated navy blue. The sun started off in a late-phase orange color, having spent the deep purple quickly before even cresting over the horizon. There was a lot of that “muted gray” color in the sky which helped to mix up the color pallet from the orange to deep blue gradient that I would have seen if the humidity were lower. I, for one, can’t wait for day light savings to kick in later this week. Maybe I should go somewhere to celebrate the occasion. It’s funny how things slowly slip by with the currents of time until they take on a different feeling all together and you have to *remember* what the feeling of that thing was just a few months ago. 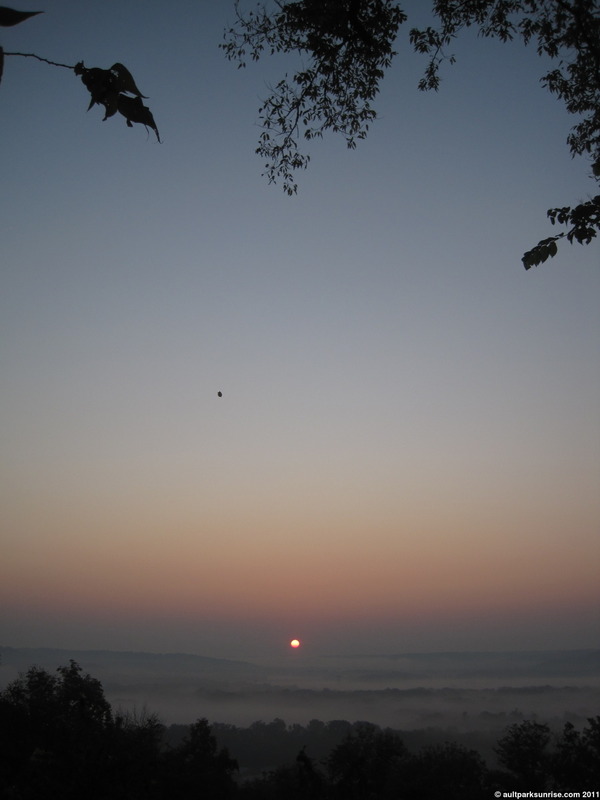 Looking back at my mid-summer sunrise posts, I find it neat to read about how quiet and calm the sunrise rides were. No cars or traffic, no people, just the birds and squirrels and the sunrise. This morning’s 8:06am sunrise had me fighting rush hour traffic just to get across the street! When DST finally ends and we jump back an hour, hopefully I’ll have a few weeks of calmer sunrise rides. 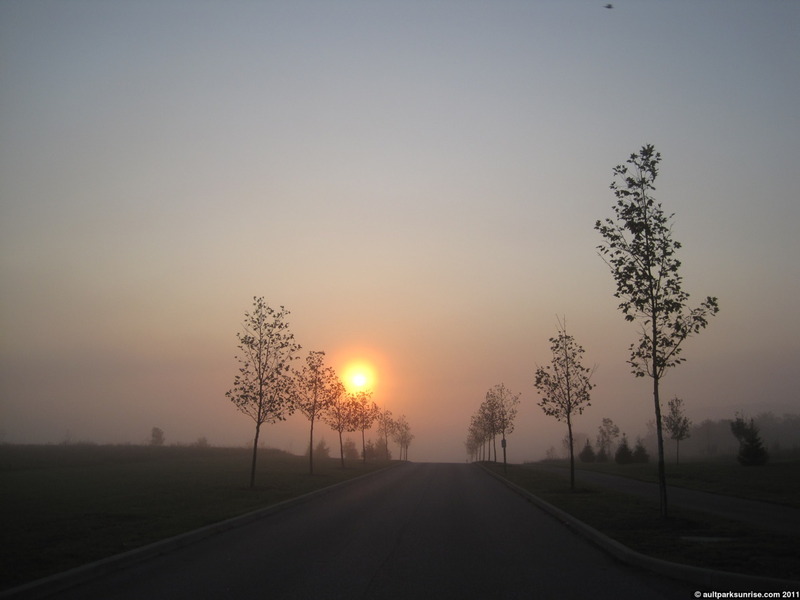 The latest that the sunrise will come up until NEXT autumn is around 7:50am sometime in the middle of the winter, so this week will officially be the latest sunrises of the whole project. I *have* been saving up a special contact for a few months now that I haven’t actually reached out to query. More on that later. Without further ado, Sunrise 112. 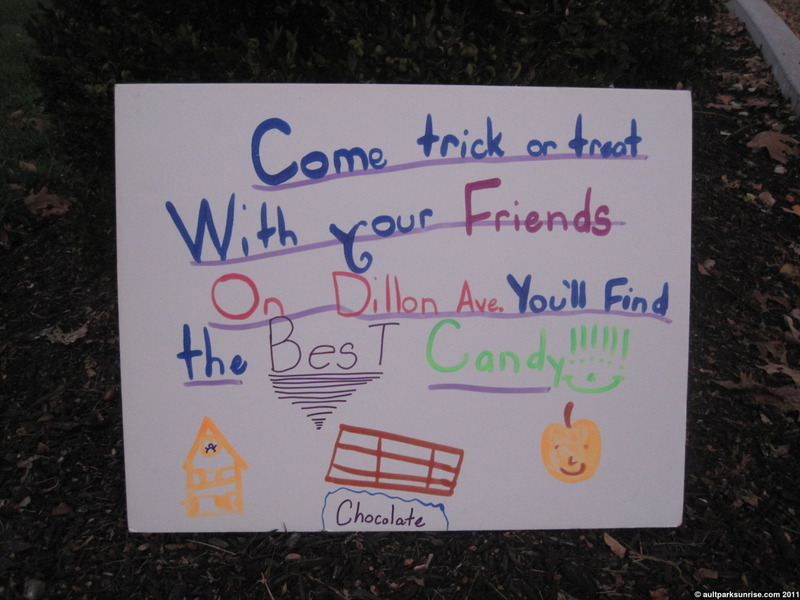 As I climbed up the hill to Ault Park, I passed this left over from last night’s neighborhood trick or treat. I was cracking up to myself at the effort that the house put in to attracting trick or treaters. I don’t blame them, though. 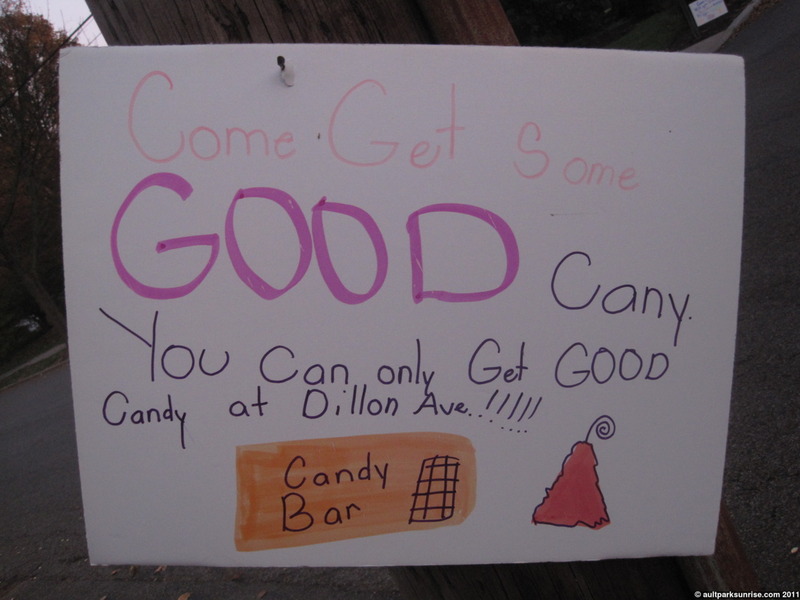 Dilon Ave is a cul-de-sac so it’s possible that there would be less volume of kids walking around. It makes sense to advertise! The wife unit and I sat outside last night with a bucket of candy but we didn’t have as much luck. I kind of wish we had a sign, too! Oh well now we have lots of left over butter fingers. 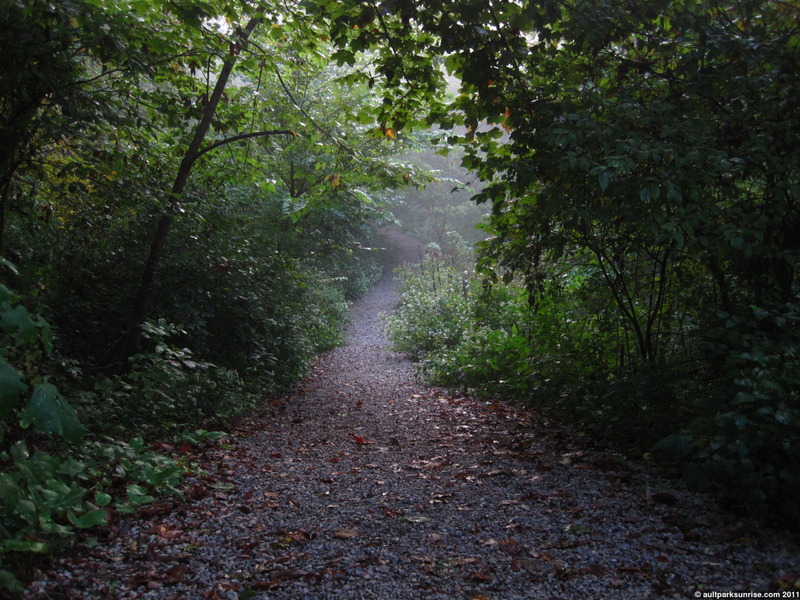 There was a layer of mist in the air and around the bondaries of the forest, but the park was mostly clear. 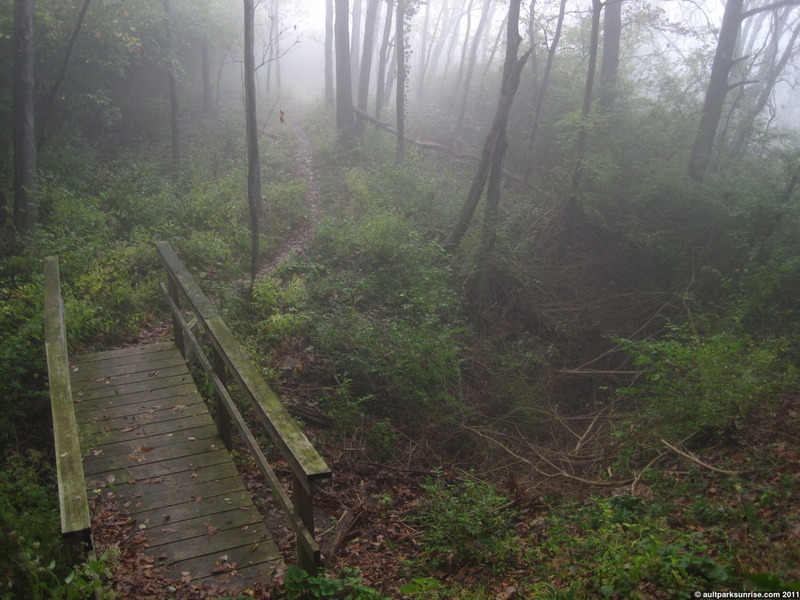 Upon arriving to Heekin Overlook, I was greeted with a “classic” foggy valley that provided seamless gradient into the atmosphere. The sun was due to show up in about 10 minutes, so I poured myself a coffee and looked out across the foggy valley. 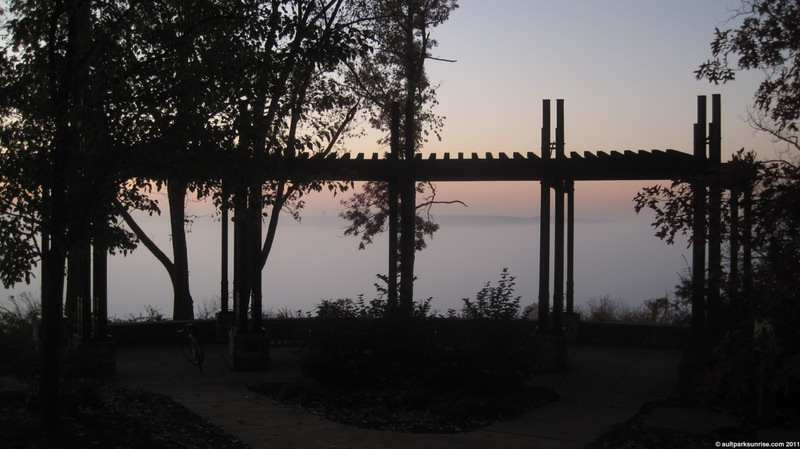 Heekin Overlook @ Ault Park. Just before the sun came up there was a bright deep orange/purple halo that illuminated the area just above the horizon. As I was waiting for First Light, several packs of birds flew out from over head. What is always interesting to me is how the sun doesn’t waste any time pushing the fog into the park once it crests over the horizon. 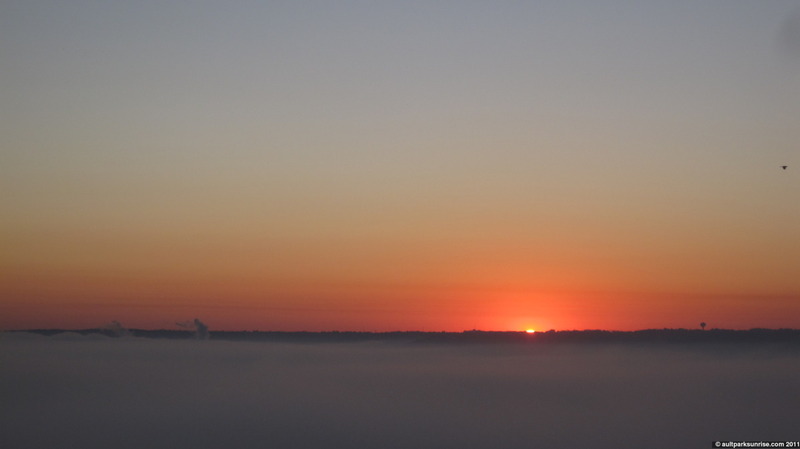 This morning was another foggy sunrise in Cincinnati. I had to make a choice when I got up this morning. 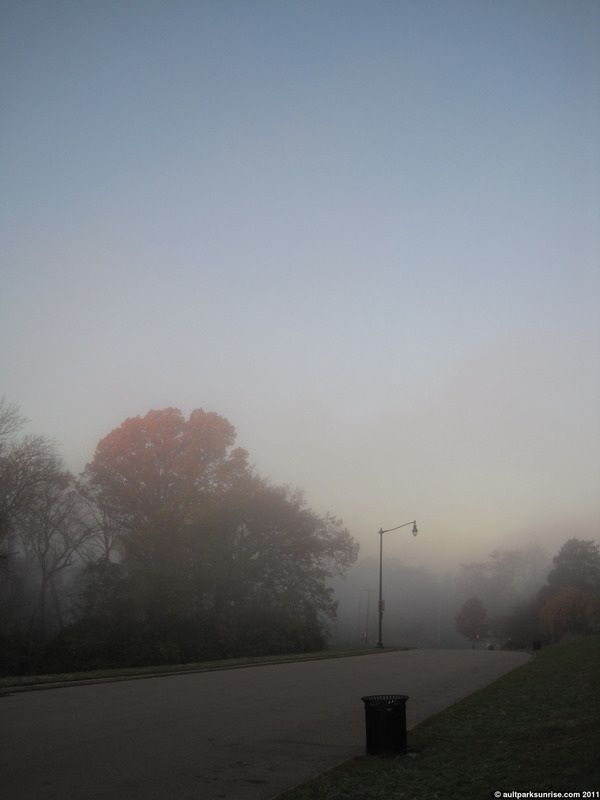 I could tell that there were clear skies above me but around the edges of the neighborhood there were patches of fog. 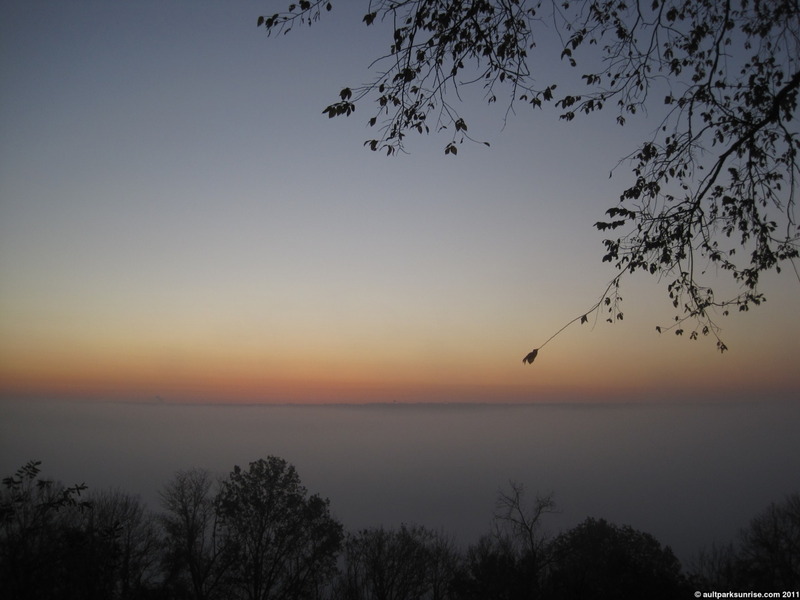 I could chance seeing a clear open sky sunrise at Ault Park, or drop down into the Ohio River Valley and visit Lunken Airport in the fog. I haven’t been down to Lunken in a couple weeks so I decided to check it out. 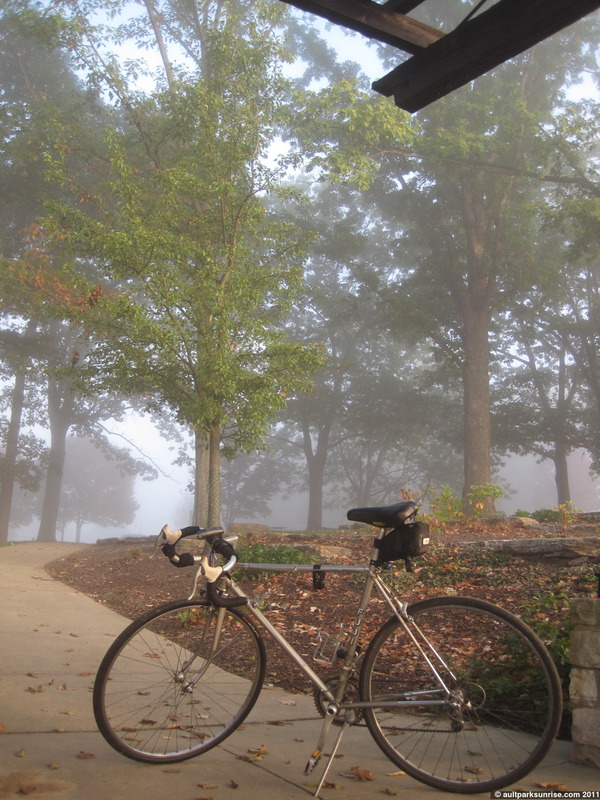 As I rode down the 400ft descent past Alms Park, the air slowly became thick with humidity until I reached the basin. 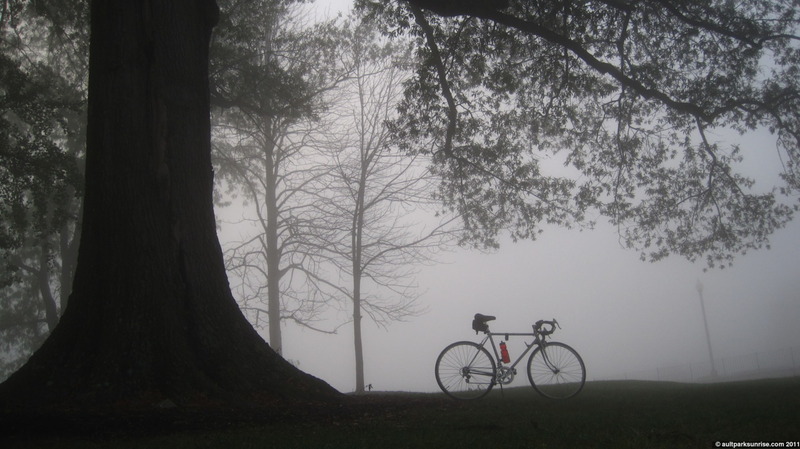 When I popped out onto Eastern Ave and pedaled past the late 1800s river town business buildings, schools, and churches, I was soon engulfed in a thick, freezing cold, but quiet fog coming off of the Ohio River. The temperature was about 38F or so and I forgot to put on gloves. My bike had water condensation from the air, and it made my hot coffee that much more enjoyable. 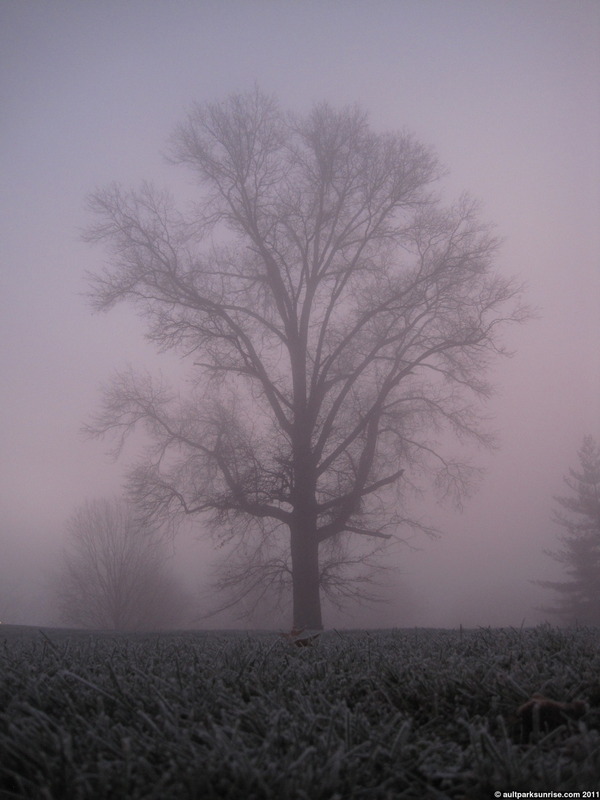 There was no chance at seeing the sunrise this morning, so I enjoyed the fog and the peace and calming that it brings. 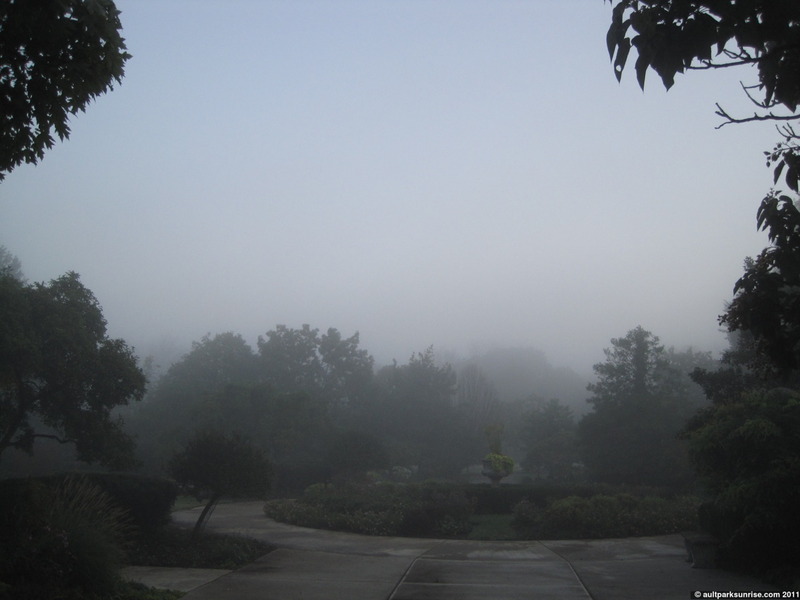 It’s funny how fog tends to amplify some sounds and muffle others. 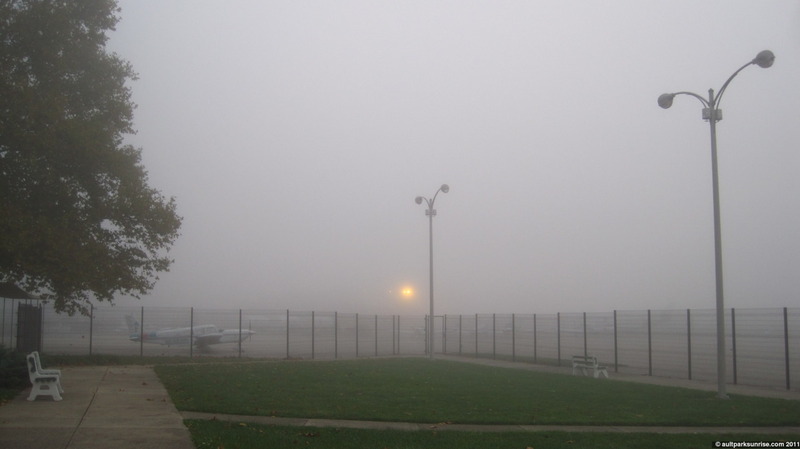 I could barely hear the traffic or the hum of the commuter planes waiting for the fog to clear up, but I felt like I could hear the gossip of every Canadian Goose from miles around. 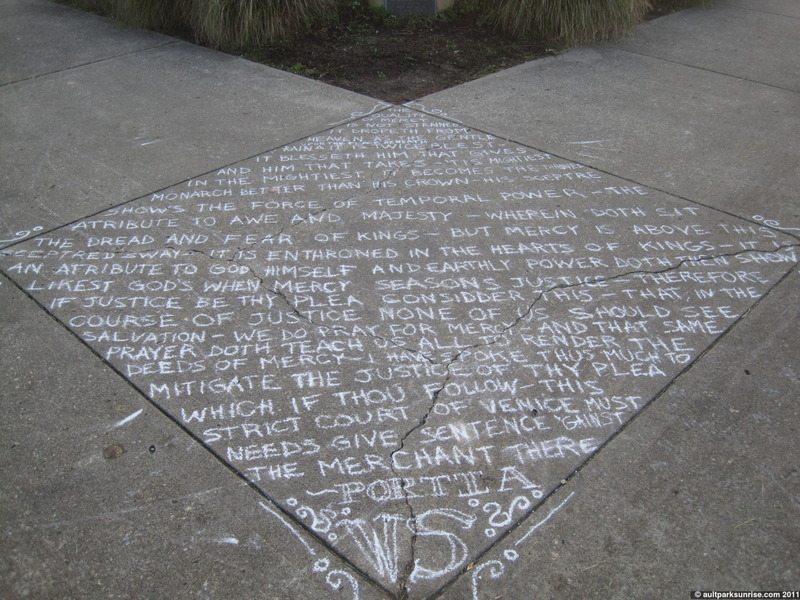 The only reason I bring up the “Ides of March?” in the title of this post is because I recently saw the movie Ides of March featuring Ryan Gosling and George Clooney. I’m not much of a political drama kind of guy, but I sure did enjoy recognizing all of the neighborhoods and cubbies that were showcased in the background of the movie that is set in Cincinnati. There is one specific scene where one of the actors (I can’t remember who) is getting on a plane at Lunken Airfield. That scene kept flashing through my head as I stared at the terminal building in all of its art deco glory. I couldn’t find an actual clip from the movie, but if you check out the very brief flash at 47s of the official trailer, you can see Ryan Gosling walking through a gate onto an airplane. 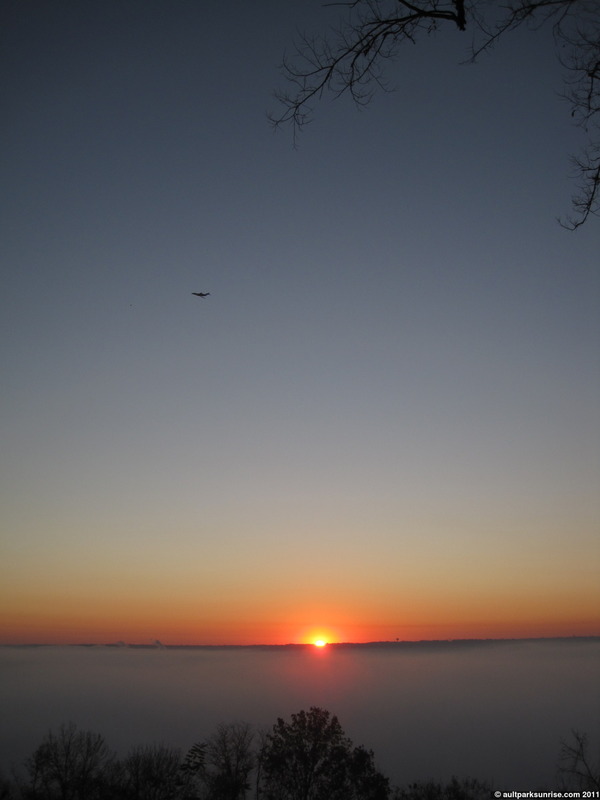 For all I know, it’s one of the airplanes I see coming in most mornings from Ault Park. In that scene, the terminal is behind us (and was just shown but the trailer doesn’t have that part) and the Little Miami River and levee is in the background. Just a bit of fun trivia. Approaching Lunken Airfield is the old railroad that runs through East End. One day this may be a bike trail that connects downtown to Mariemont and beyond. Welcome to Cincinnati! 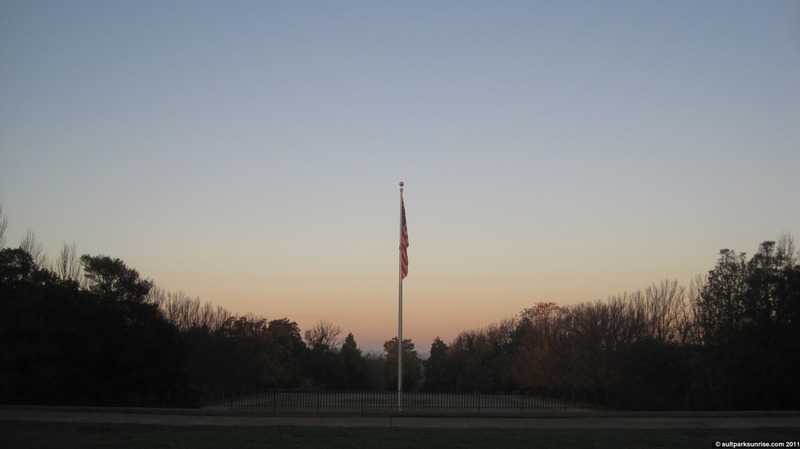 This scene is featured in the Ides of March. Remember earlier when I linked to the video of Ryan Gosling hopping on a plane in Ides of March? This is the gate that he is walking through. 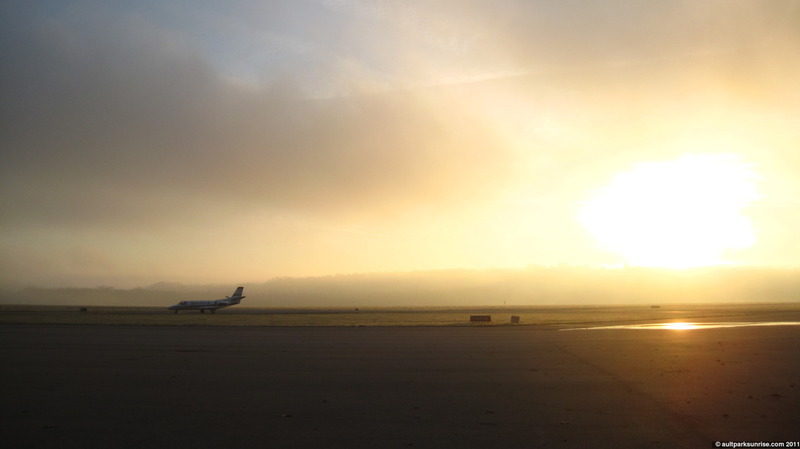 The “yard” of Lunken Airfield. 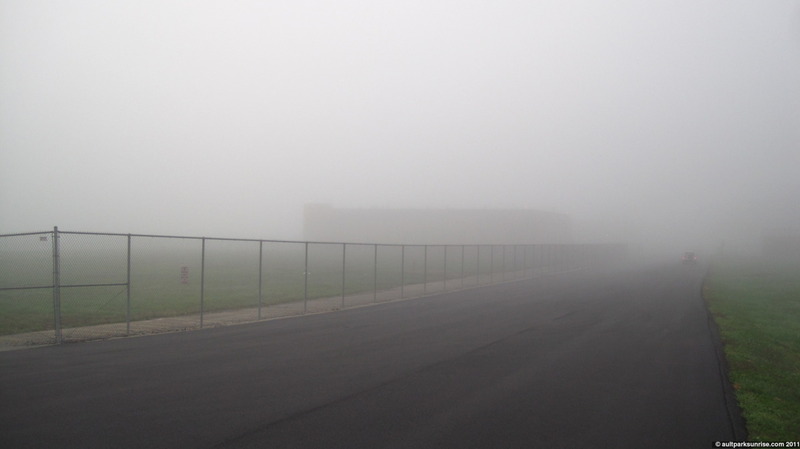 This is the small access road that runs along the airfield, disappearing into the fog. 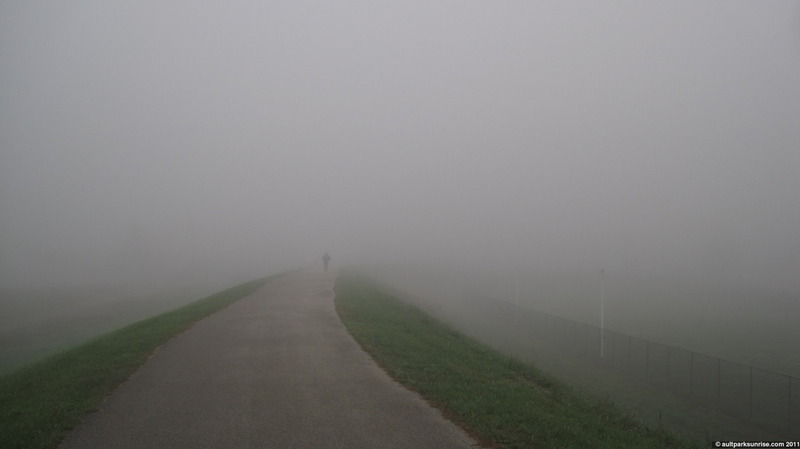 A lone walker, stern in his dedication to his pedestrian ways, walks into the fog. 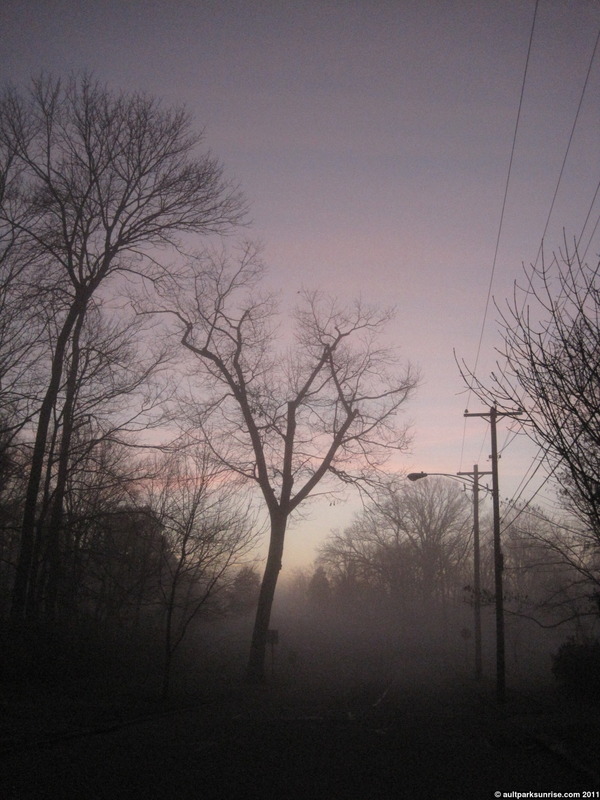 Sometimes the fog creeps me out. If I were some kind of large creature of the night, I would definitely feel a bit more comfortable creepin’ around in the dense fog. On the way back home I pass by St. Stephen’s Church. I’ve tried on several occasions to take a decent picture of the steeple but the sky is always bleached out. The fog provides a nice soft backdrop. It’s a classic italianette style, something that you can see all over this area in the architecture of the buildings that were constructed during the late 1800s. By the time I got back to Mt. 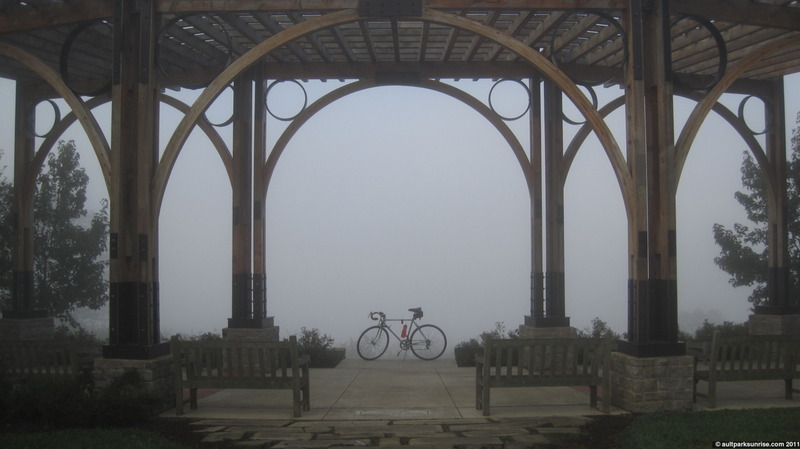 Lookout Square, the fog had actually crept in from the valley and it was denser than when I left a half hour earlier. 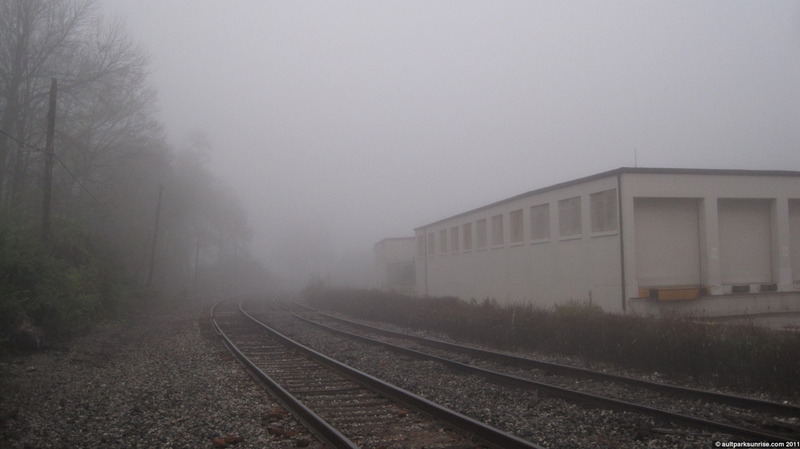 It isn’t often that the fog makes it this far inland. 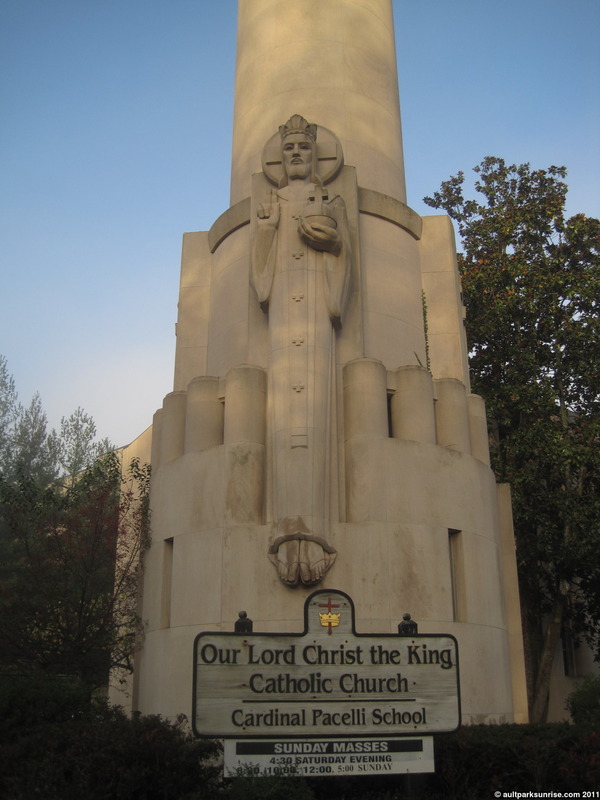 This is the steeple of Our Lord Christ the King Catholic Perish & School on Linwood Ave. It’s positioned well so you can see it anywhere on Linwood Ave or in Mt. Lookout Square. 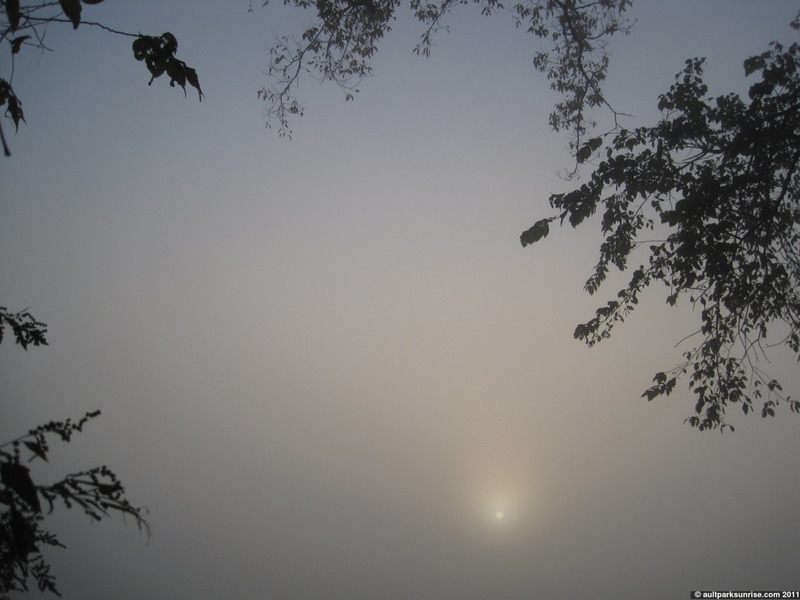 Here we see it catching the first rays of sunlight that are penetrating the fog. Tall & Skinny Jesus says “Peace, dude”. The 15 cars that were waiting at the traffic light ten feet away were probably wondering what I was up to. Or they didn’t notice at all. 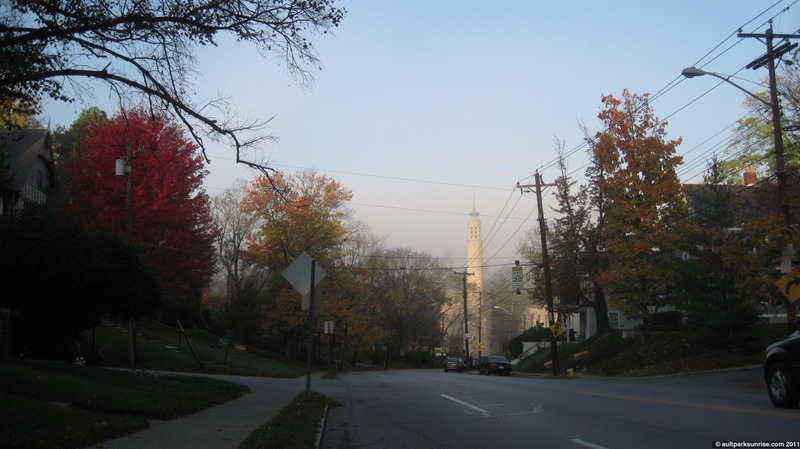 Continuing up Linwood toward Ault & Alms Park, I couldn’t help but taking this final picture. I was hoping that tree to the left showed brighter. It is just blazing in red color. I need to find out what kind of tree it is. Looking down the hill from Alms Park. The base of this huge century oak tree is wider than my bike is long. Almost two of my bikes, in fact. I didn’t have a chance to get this post up yesterday morning so it’s coming at you a day late. After several days of overcast, the conditions came together perfectly to create an intensely foggy morning. The skies were clear and the ground was wet, and it was really really cold. It was easily in the upper 30s, perhaps even lower. I was hoping for a clear sunrise, but I got a beautiful thick fog. 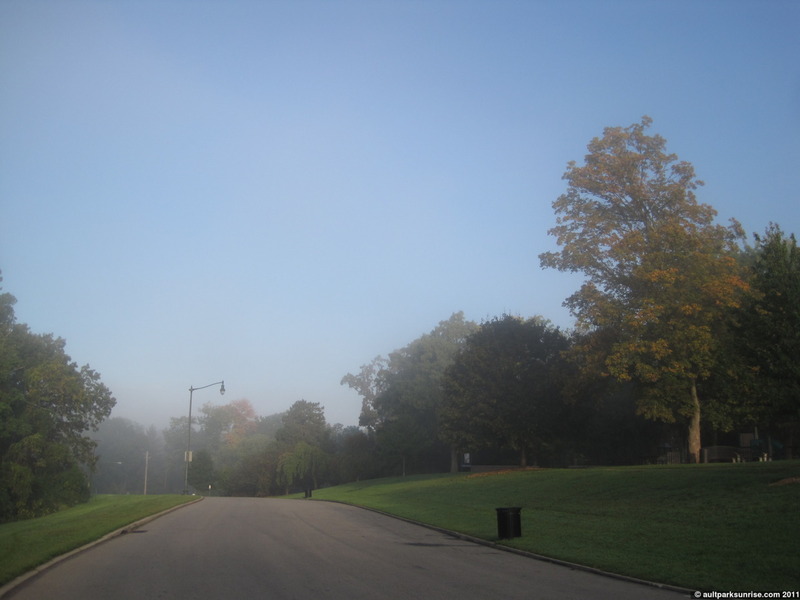 I decided to head up to Alms Park since the last foggy morning was spent in Ault Park. 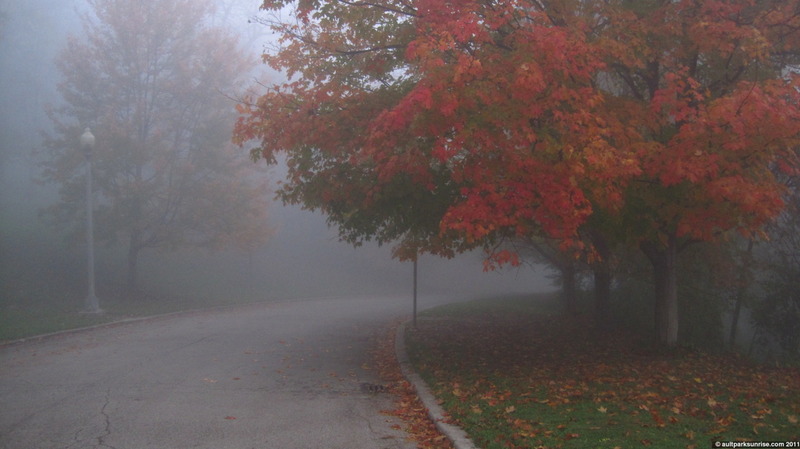 The fog in Alms Park is always exceptionally pretty. 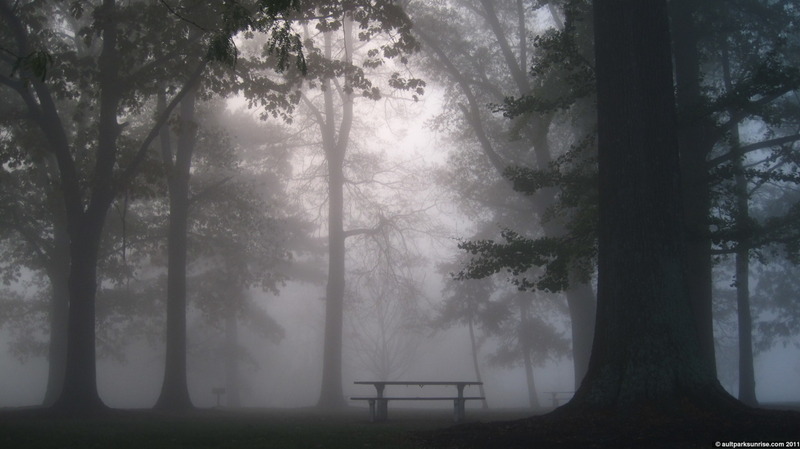 The trees in the park are old and tall and the fog adds an eerie dimension to the quiet park. I didn’t end up seeing a sunrise, but I did have the morning coffee in the fog and ventured down into the forest in an attempt to find an old secret “party area” that I found last year. I didn’t succeed, but I did find the entrance to the trail. It’s hard to follow, though, with all the leaves that are still on the trees. I’ll try again this winter perhaps :). I left early for the park. 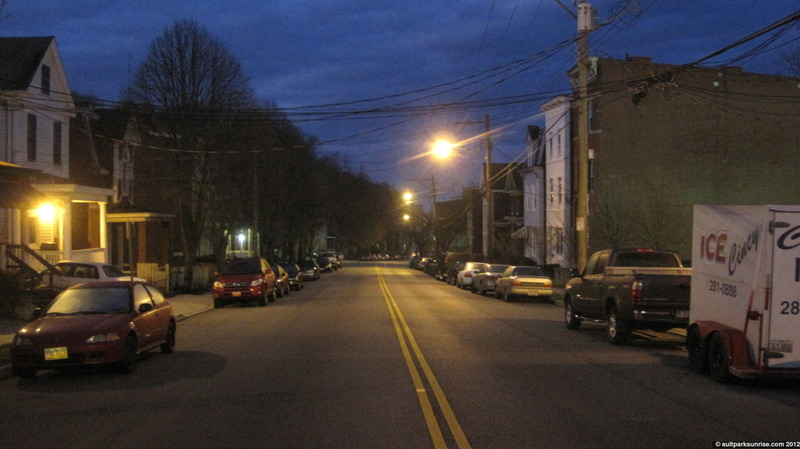 About 20 minutes before sunrise the neighborhood is dark and muffled. Looking down Grandin Ave in the fog. It’s interesting how the fog closes in the scope of attention. This huge and beautiful oak tree stands at the entrance to St. Ursula’s Villa, and I’ve never really noticed it specifically before. It has plenty of room to breathe and is certainly quite healthy. A quick post for this morning. 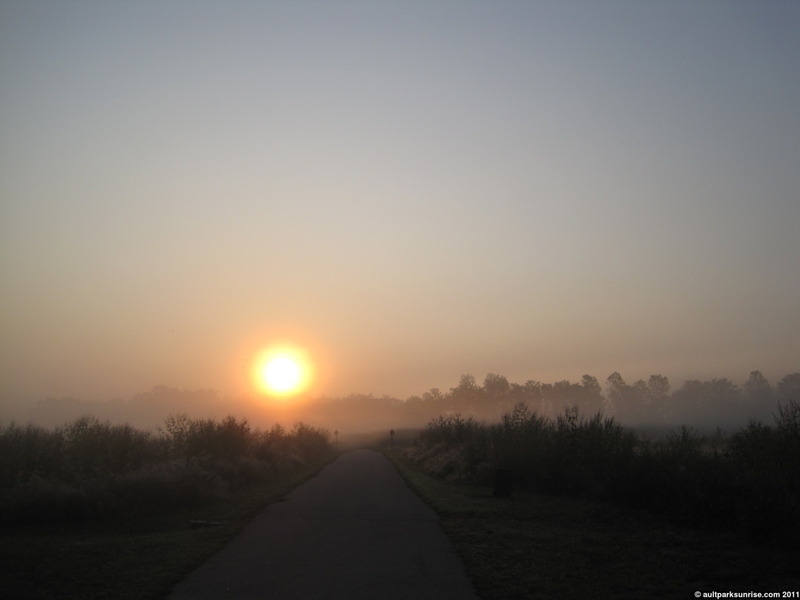 I was surprised to find another foggy sunrise in the park. My alarm actually crashed during the night so I woke up right at sunrise. Luckily the fog had my back and hid the sun from view for about half an hour. The fog was misty down in Mt. Lookout, but just beyond the entrance to the park the fog was pretty thick. This is the view out towards Lunken Airfield. The rest of the park was slowly coming out of the fog. There was quite a bit of activity, we had several joggers and pedestrians enjoying the chilly morning. No idea, but I felt compelled to capture it. Thanks Portia. Heading out of the park, we can see the sun is finally burning away the fog. There are several trees that are starting, just barely, to change colors for the fall. In several pockets of the neighborhood there are these century-old magnificent oak trees. Like this one. And this one! I have a feeling these suckers *love* these autumn fogs. 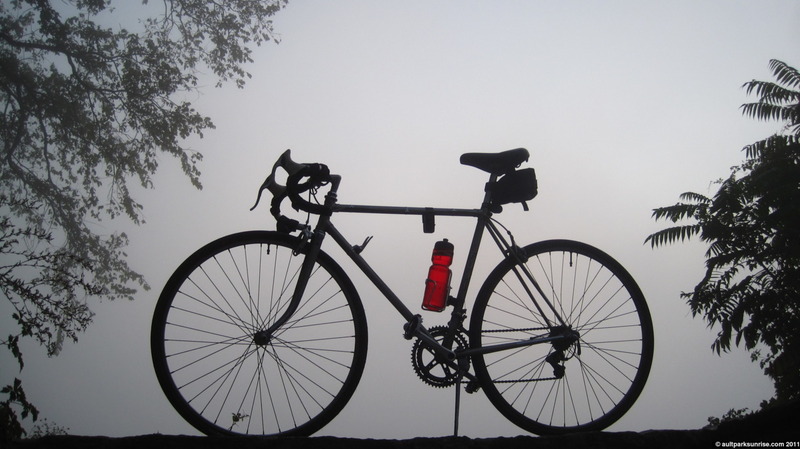 The trusty old ’77 fuji hangin’ out in the fog. One of my favorite places to take the Fuji’s portrait. 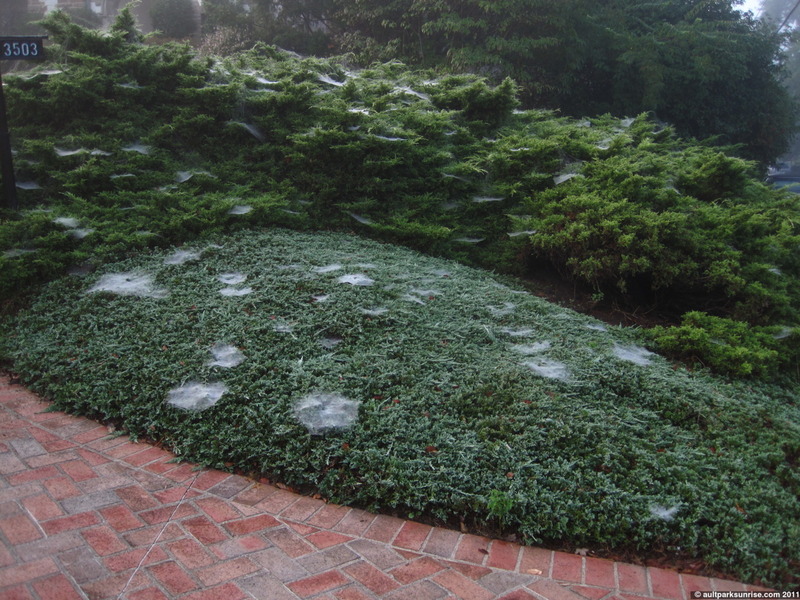 Arachnophobes should stay away from bushes in the fog. 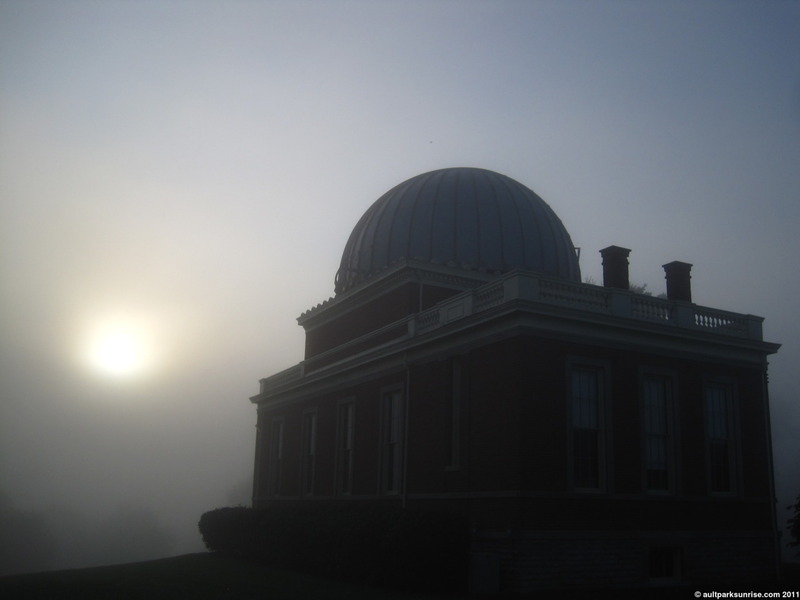 The Cincinnati Observatory against a psuedo-sunrise. Last night before calling it a night, I took a peek from our patio into the night sky. I realized that the atmosphere had cleared up and I could see the stars. 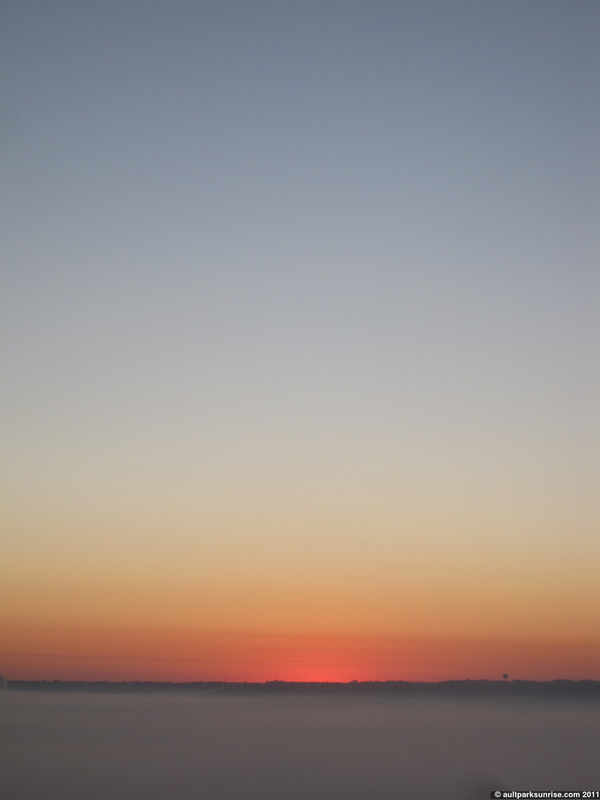 I’ll admit it, I was excited to wake up early to a cool, crisp, fall sunrise in a clear and open sky. However, when I woke up this morning I was treated to an even bigger surprise! This morning was one of the rare mornings that happen once every few months (and hopefully more often this fall with all this rain!) 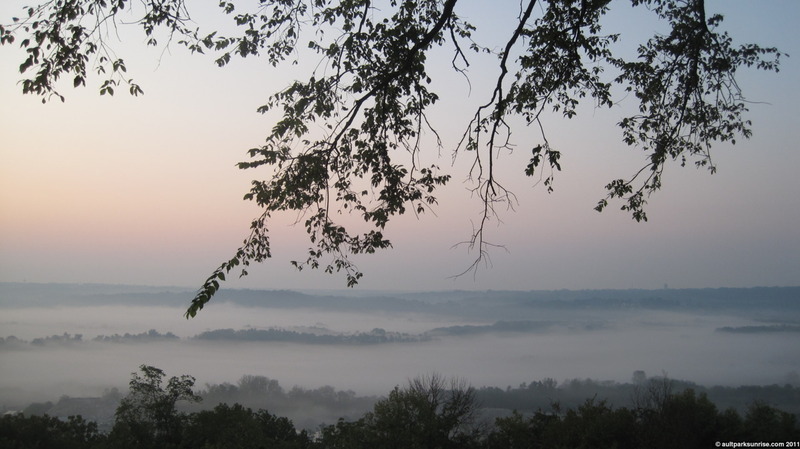 where the thick fog from the valley overflows and spills into the hills of Mt. Lookout. 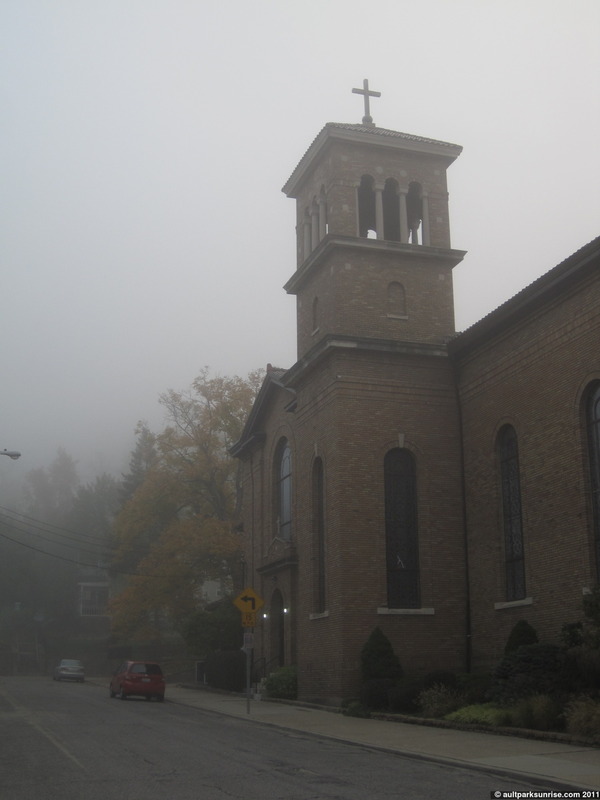 The fog was lightly patched around the square in Mt. 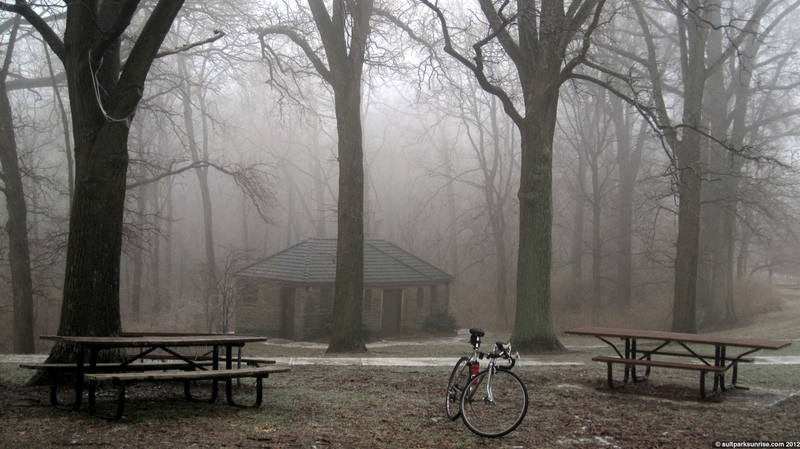 Lookout, and even sparse on my ride through the neighborhood to Ault Park, but once I hit the park boundaries it was like riding into a hazy wonderland. I didn’t get the clear morning sunrise that I had expected, but the quiet and muffled morning in the fog was worth the exchange! I was literally like a kid in a candy shop. I wanted to see Alms Park, Lunken, Armleder Park, and all the residential no outlets that I’ve come to appreciate. But alas, time enough there was not. The descriptions, unfortunately will be brief this morning. I’m on my way out the door to check out my first Little Brown Jug horse race up in Delaware, Ohio. Coming out of a thick patch on the way to the park. Up ahead it is foggy. At the top of this hill is Ault Park. 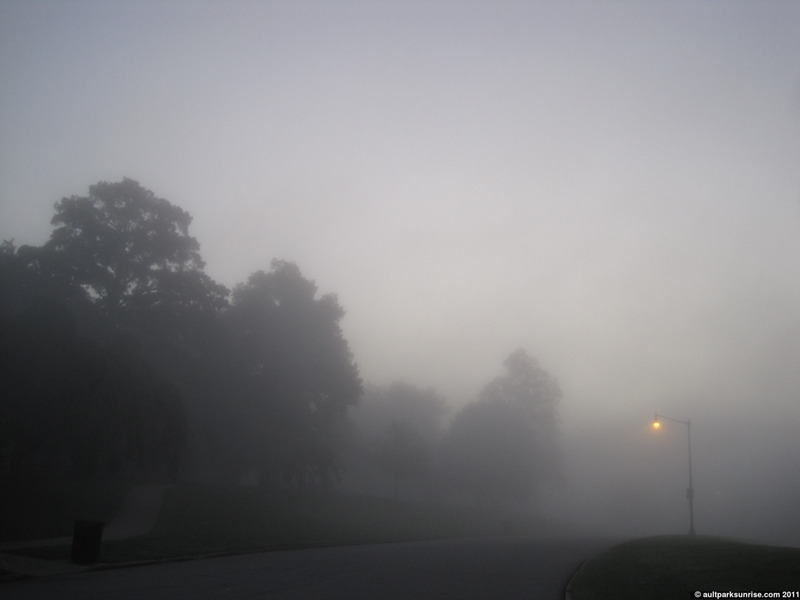 As I enter the park, I can “hear” the fog around me as all ambient sounds beyond 50 feet away become muffled. It’s even thicker up near the pavilion where the fog is still literally pouring in from the valley just 200 yards away. Knowing that there will be no sunrise, I take a stroll through the quiet garden. 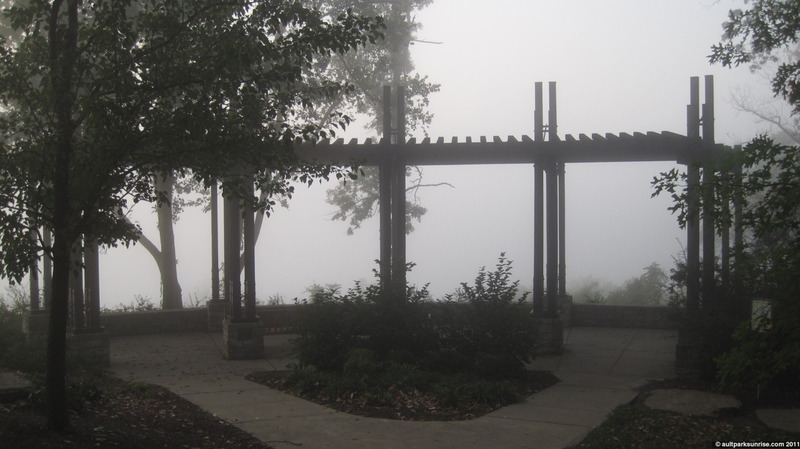 These are the shelters in Armleder Park that we see, on a clear day, from Heekin Overlook in Ault Park. 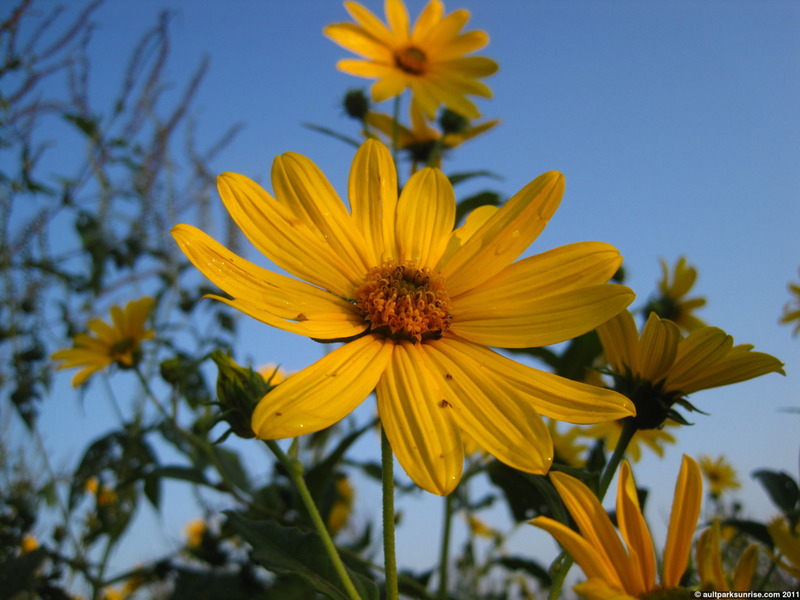 Blue Skies and yellow Flowers. Sunrise 94 was the first clear sky sunrise that we’ve had in several weeks. 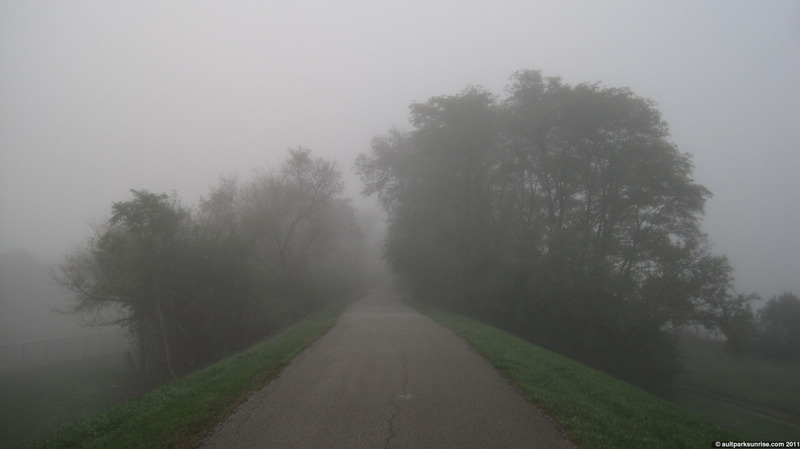 The high humidity that is no doubt left over from the hurricane behavior provided a thick wet blanket across the Little Miami River Valley. The sun rose up in a deep red hue. It was one of those sunrises that you can stare directly into for a full 10 minutes after sunrise without worrying about it being too bright. 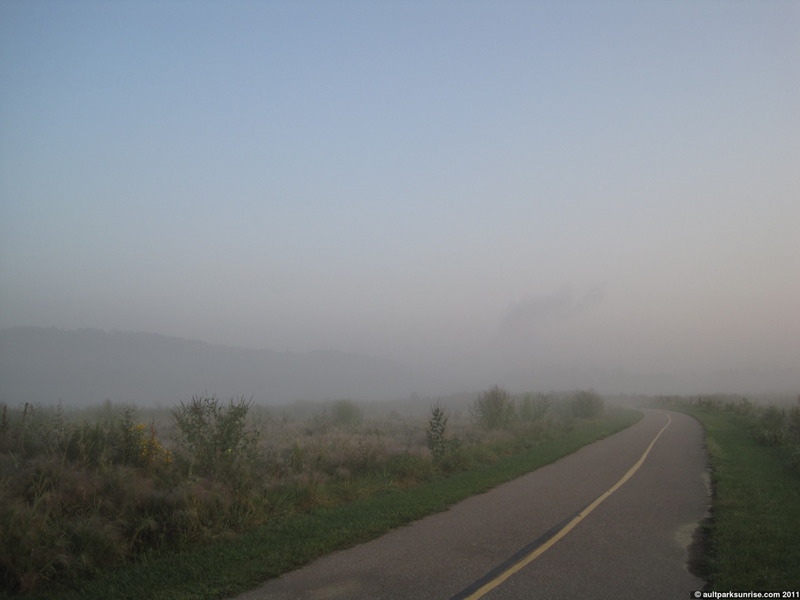 I took the opportunity to drop down into Armleder Park and ride through the prairie in the fog. It is amazing how fast the sun dissipates the moisture from the air. 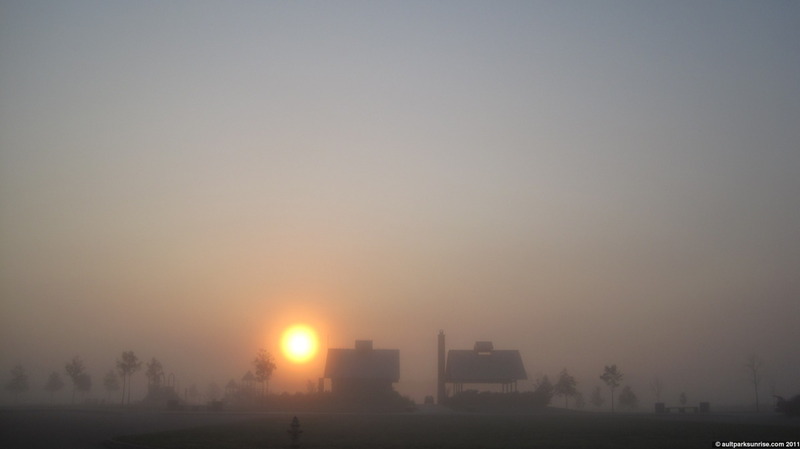 The fog rarely lasts longer than 25 minutes after sunrise. The river was flowing quietly and I climbed through the now lush 7-foot high river foliage where the packed mud trail has become a mere suggestion to emerge soaking wet on the other side. 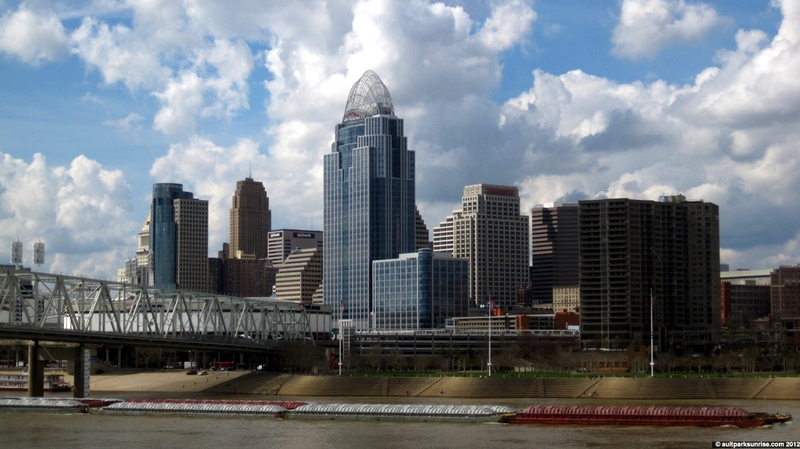 Cincinnati is in a northern-most tip of the “Sub-Tropical Humid” climate, the same climate that encompasses most of the South and South/East of the US. 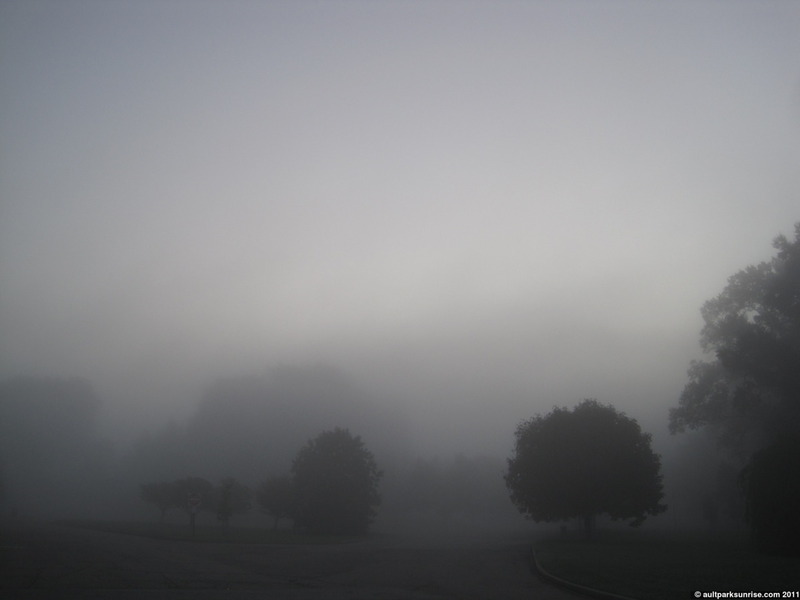 This fog is likely a crucial element in the ecology of the river basin plant life. The foliage is lush and green and it seems that almost daily there is a morning transfer of water from the river, up to the air, and then onto the plants as the sun warms the fog. 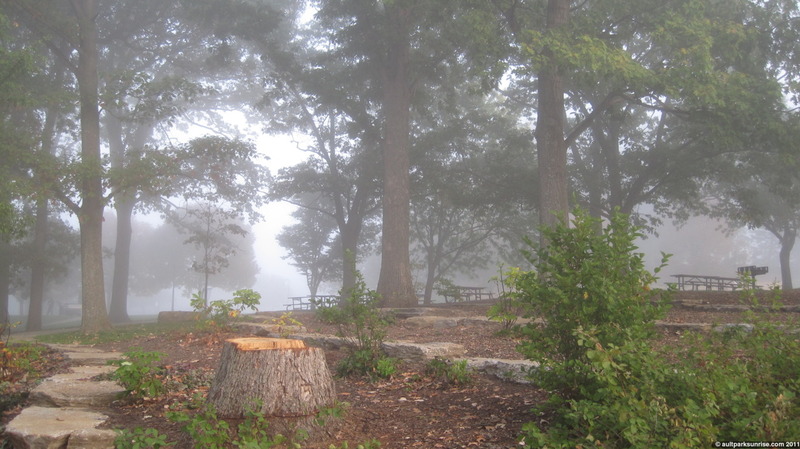 I find it interesting that Armleder Park seems to always be foggy. The Little Miami River is smaller than the Ohio River, and yet the fog of the Ohio River rarely spills beyond the river’s banks. I wonder what’s up with that? It looks like it’s going to be another beautiful day out there. It’s amazing how much that streak of overcast rainy days can make me appreciate these clear cool late-summer ones. The early dawn was dark! Looking East over the Little Miami River Valley. That’s where we’re about to go. Down the hill into Armleder Park. The colors were dominated mostly by a light pink that is so hard to pick up with the camera. Into the park we go. Most of these pictures are kind of dark so I’m sorry about that. 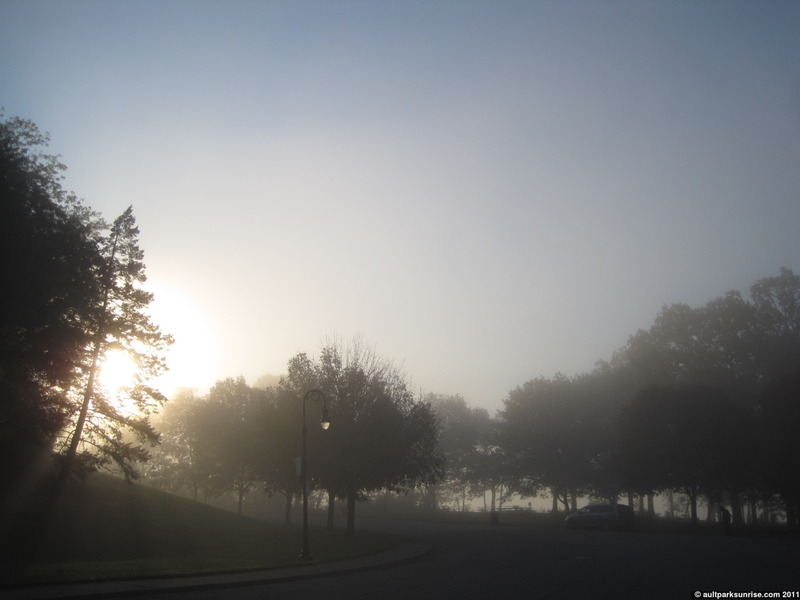 Under the blanket of fog, however, there truly isn’t much ambient light unless you’re looking straight into the sun. A vertical shot in an attempt to capture the blue in the sky. I head straight through the park to the small dead-end that dumps us out in the forest.